(5/31) Like the weather, fishing has definitely heated up. Multi-species fishing is in full swing. Bass season is open and both largemouth and smallmouth bass are very active in the Grand Rapids area, especially on Pokegama Lake, which is one of the best bass lakes in Minnesota. Panfish are in the pre-spawn mode and can be found in or near shallow water pencil reeds in most lakes around Grand Rapids. A slip bobber rig with a couple feet of line and a small jig combined with a small minnow or soft plastic will do the trick. Spawning male crappies will be very dark, so don’t think you have found a missing link fish. Walleye action is also still very strong and because the surface water temps have jumped into the high 60s many “eater” fish as well as the nice “releaser” are active. Perch and northern pike have also been been on a strong bite. For trophy walleyes and northern pike, Pokegama Lake is probably the best, but the action has also been consistently good to excellent on larger lakes like Bowstring, Sand, Jessie, as well as Big Winnie and Big Cut Foot Sioux. Both a jig and minnow and rig and minnow have been the best presentations. 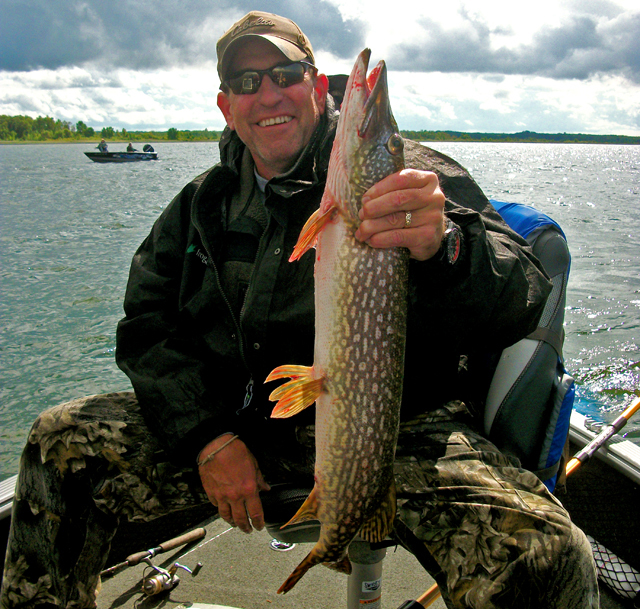 For fast northern pike fishing, Ball Club Lake is probably your best bet. Bait shops have great numbers of spot-tail shiners, chubs and leeches and crawlers and current fishing information. The next couple of weeks look to be a great time for fishing in the Grand Rapids area. Check Visit Grand Rapids for details regarding resort accommodations and updates. (5/21) Whether you live here, have a cabin here or are visiting or vacationing here in the northland, one thing we all should remember is that we have access to world-class fishing for walleye, northern pike, panfish and largemouth and smallmouthbass right here and around Grand Rapids, Minnesota. And one of the best times of year is coming up - Memorial Weekend. This weekend is not only prime time for fishing multispecies, bass season opens on Saturday May, 24th. Because the water is heating up and most fish (except panfish) are post spawn and ready to put on the “feed bag.” The jig and minnow combination is still the “go to” presentation as it will catch all varieties of fish; we have, however, seen anglers catching fish on live minnow rigs (leeches tend to ball up in cold water). Slip bobber combinations have also been good, but you do have to anchor up as drifting changes depths and too much speed causes the bait to angle up and not be vertical. Locating shallow water structure that houses pods of bait will inturn hold active fish that follow the forage closely. Look for rocks and gravel structure along shorelines but don’t rule out inlet and outlets of moving current. With bait fish starting to show up in growing weed beds it won’t be long until fish start covering these new weeds. Keep your drifting and trolling speed under control and slow and concentrate on structures 12’ and under. - Have a safe and happy Memorial Weekend. Good luck fishing! Nik Dimich is a fulltime, year round Grand Rapids, MN and Lake Winnie area fishing guide. (3/1) On Pokegama Lake, and most other Grand Rapids area lakes travel is still possible. But the most efficient way to get to your fishing spots is with snowmobiles or UTV/ATVs with track systems. On the big lakes like Winnie or Bowstring go to the resorts and use their plowed roads. But check with them first as winds will close these roads quickly. 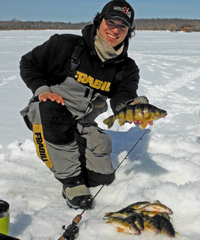 Perch fishing has been offering families and friends a good “action” bite and the perch are reaching the transition stage of moving from deep-water soft spots to shallow water structure in the 10-15’ depths. Look for underwater points near deeper water and fishy structure in the shallows that hold pods of minnows and other live forage for perch to feed on. Fish with spoon type lures that glow or rattle in the 1/16 - 1/18 oz size, tipped with a minnow head. Jig aggressively to attract bigger perch. 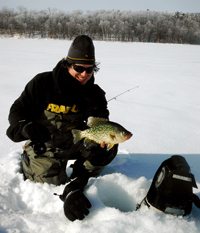 For crappies and bluegills, head to the deep holes and look for them to be suspended in and around these deep holes or the slopes and sharp breaklines that lead to them. For a shallow water approach, find weed beds in 10-15’ depth. Look for panfish on mid-sized lakes to be in and out of the weed lines with patches of soft bottom in them. On smaller lakes, look for fish to be sliding into deeper water basins to feed on bugs and other forage that attract hungry fish. Use this “deep hole” strategy as a good starting point to drill a line of holes to look for suspended fish on the sonar. For panfish try small “bug type” lures tipped with wax/spike worms or small plastics. Since every lake differs, it’s still best to check in with our local bait shops, sporting goods dealers and resorts current ice conditions and fishing hotspots and tips. For you traveling fishermen, if it is an option, trailer up the snow machines or track vehicles and hitch on portables to pull. It is a perfect time to get outdoors with friends and family in Grand Rapids, and, remember, in Grand Rapids, “We are in Minnesota’s nature.” Good luck and we hope to see you on the ice. 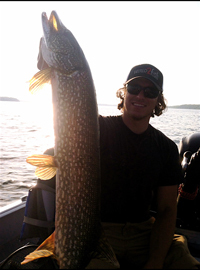 Nik Dimich is a fulltime, year round Grand Rapids, MN and Lake Winnie area fishing guide. To book a trip, please contact him at www.DimichOutdoors.com or “like” Dimich Outdoors on Facebook. (2/11) As the temperatures have gone above zero and the snow pack has firmed, the perch fishing ramped up to a good “action” bite. Still, some sorting has been in order to fill a bucket. Due to the fish being on a minnow bite, and the minnows have been moving, a “run and gun” approach has helped. As the perch move into the deeper water saddles with soft spots in the bottom and feed on larvae and bug hatches they will become more stationary, but for now it is a “chasing” game. Don’t overlook the shallows, however, as some perch schools are still biting there. Because each lake varies in depth and has varying types of structure which hold fish differently, look for inside turns and contour differences adjacent to deep water from shoreline structure and work mid-lake structure the same, as perch tend to at times drop off into deeper water. Panfish are still being found in and around the weeds in 9-14 FOW but some are starting to head for the deeper holes off sharp drops. Look for them first on the rims of the deep holes. Northern pike and walleyes are still active, with the best movements coming in low light conditions like early morning or evening and on cloudy days ranging from shoreline to mid lake structure depths of 18-26’ of water. 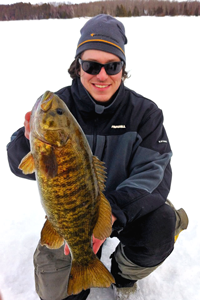 Nik Dimich is a fulltime, year round Grand Rapids, MN and Lake Winnie area fishing guide. To book a trip, please contact him at www.DimichOutdoors or “like” DimichOutdoors on facebook. (2/11) From Wired2Fish: Lews Sold Spinning Reel Giveaway - "Each year Lew’s elevates its position in fishing by building high quality and durable rods and reels at affordable prices. From the beginning Lew’s worked diligently on high performance bait casting reels that performed as advertised and they hit that mark right out of the shoot. Building high quality spinning reels was next on the docket and they just introduced a new Team Lew’s Gold Spin spinning reel with 10 bearings and a high speed 6.1:1 gear ratio. The reel (TL3000H) has a carbon re-inforced body and side plates, slotted anodized spool, digi-balanced graphite rotor and an external lube port. Light, smooth, and durable with good looks to boot. Lew’s would like 4 Wired2Fish readers to own one of the very first ones. All you have to do is sign up here for a chance to win one of these reels. >> Lews Sold Spinning Reel Giveaway . If you are, indeed done, and your “enthusiasm pail” is half empty, then it is time to concentrate on Minnesota’s fourth season, which occurs starting this week, and that is the “show” season, the boat, travel, home, deer classic, sport business/vendor-based extravaganzas that grace our late winter/early spring wonderland. Yup, if you are, indeed, done ice fishing, then it is also time to head to the sporting goods stores and bait shops and look for ice fishing clearance bargains, of which there are many. If your “fishing pail enthusiasm” is half full, however, you might be looking at perhaps a much better second half of the ice fishing season than the first. Why? Well, for starters, the ice is great, the snowpack has settled, and the fish that were not caught due to the cold and windy and slushy conditions are still there; the nice thing about our northern fish is they don’t migrate like our ducks and geese. One of the major differences between open water and winter fishing is mobility. In open water we can pretty much find a place to fish no matter the wind or temp and if one place doesn’t pan out, we can move. When ice fishing, however, we are at the mercy of the elements, that is, when it’s too cold and windy to move, we just don’t. We stay put and hope for the best. Even though our Dimich Outdoors’ ice fishing mobility is probably among the best available because of our Polaris 800 Crew, masterfully upgraded with a cab and heater and four tracks and much, much more by Kirk Davis’ Grand Rapids based “Wide Open Company” (check out its website), it still is not much fun “running and gunning” when the wind chills hit double digits. When we have to move, however, we move, but with much trepidation. Literally “half filling the pail” lately has not been that difficult if you lower your expectations. I am not saying we have been keeping everything, what I am saying is that sometimes we have to diversify. Instead of looking for the trophy northern pike, keeping a few smaller ones for pickling or making fish cakes or chowder might be the ticket. 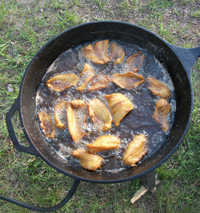 Instead of spending all day searching for elusive walleyes, maybe look for some tulibees for smoking or some panfish to fry up like potato chips, taking only enough, of course, for a meal. When heading out to fish for panfish, bring small minnows, waxies (both real and fake) and “noodle” rods or rods tipped with the add-on spring tips, which are available where any ice fishing stuff is sold. When you go to these stores and bait shops remember that due to this winter’s bad weather and coupled with last year’s horrible opener, the people who own or work at these places are like the guy in the old “Maytag” commercials—lonely. The same goes for the resorts. The money they lost last spring and this winter really can’t be made up. And speaking of resorts, at this time of year especially, if possible, try to go out on their roads or park and access the lake with your snowmobile or ATV from there. If something does go wrong with your vehicle or you get stuck, they will be there to rescue you. Nobody wants to spend a night or even a few hours marooned like “Gilligan” and his crew. Also be sure to bring your cell phone and make sure it’s fully charged; resorters are on top of things, but they are not telepathic. As a side-note, if they do help you and even if they at first refuse, slide them a nice tip with your thank you. Finally, even though your “fishing pail enthusiasm” might be half empty now, don’t pack your stuff away just yet. Warm weather has a way of brightening our moods. (2/3) From Wired2Fish; "Here are 15 proven fishing knots we think will make you extremely versatile in bass fishing. These knots will give you a lot of options for joining lines, creating loops on lures, snelling, or just getting stronger connections and quick solid knots when you’re in a hurry to get your lure back in the water. We’ve illustrated how to tie each fishing knot, and made it easy to view on your phone out in the boat. So be sure to bookmark this link for later and share it with your fishing buddies. Fishing line isn’t magic, no matter what any commercial tells you. It wears out, it builds up friction, it gets nicked, scraped, scratched, cut, stretched and everything else. So retying is important. Tying a good knot to begin with, however, is more important, so you might want to read >> Tips on Tying a Good Fishing Knot . (1/31) During a cold front, especially one like the last ones(s) we have had, walleyes lately have had a tendency to bite on a certain hump one evening and then move to another piece of structure the next. The reason is they’re chasing minnows and small perch. To counteractive this dilemma, work shorelines and mid-lake break-line structures from 22-26 FOW during the first hour of the morning and last light/early dark in the evening. 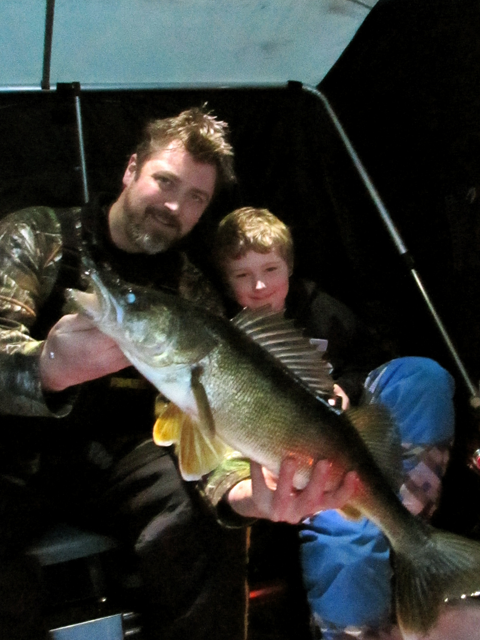 These are your best times for walleyes. On another note, perch fishing has been a good “action” bite, but some sorting has been happening in to “fill a bucket.” A “run and gun” approach has helped when the perch move into the deeper water saddles with soft spots in the bottom and when they feed on larvae and bug hatches. There are, however, some perch still biting in the shallows. Each lake varies in depth and structure and this will hold fish differently, so look for inside turns and contour differences adjacent to deep water for shoreline structure, then work the mid-lake structure the same, as perch will drop off into deeper water. Panfish are still being found in and around the weeds in 9-14 FOW, but some are starting to head for the deeper holes off sharp drops. Snow cover on lakes varies, but with the wind blown drifts and hard packed snow it’s still best to access through resorts using their plowed roads. On big lakes like Winnie and Bowstring this is not only the easiest way to get to your fishing locations, it is the best way to get off. Because of the deeper snow cover and drifts we are also now starting to see more snowmobiles, ATVs and side by sides accessing lakes to get off the beaten path. Be sure to check with area bait shops, sporting goods dealers and resorts for ice and road conditions. Good luck fishing and remember it’s a great time of the year to be outdoors. See you on the ice! inchers, with most fish in the nine to eleven inch range. (1/28) Now is the time of year to get out and about and explore many of the different lakes and lake structures Itasca County has to offer. A decent snow cover that has been blanketing our local lakes and trees provides a nice backdrop and is excellent for snowmobiling, cross-country skiing and snowshoeing. A solid ice-pack offers visiting families and friends an opportunity to not only travel on our lakes, but to fish them, especially those that are hard to access in the open water season. 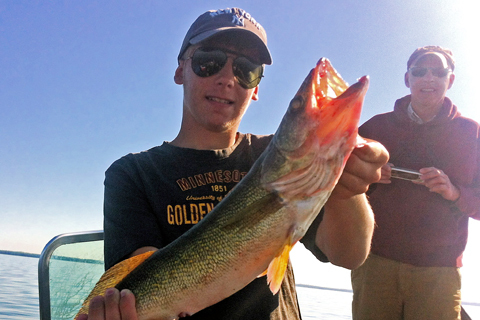 Look for walleyes, perch and pike in and around underwater shoreline points, sunken islands. Also fish the humps and bumps and bars. Check lake maps for spots. Once you find fish or fishy structure, use shiner/chub heads on jigging spoons or full minnows with a jigging and/or “set rod” technique. On Pokegama Lake and other Grand Rapids area lakes travel across the ice sheet is near perfect, but the most efficient way is still by snowmobile and ATVs/UTVs that are “chained up” or equipped with a track system. For the safest vehicle travel on the big lakes like Winnie or Bowstring go to the resorts and use their plowed roads. This is still the best way access the lake and get off safely. On Pokegama, walleye fishing has been a hit and miss proposition, with evenings and early morning more productive than the others. The last hour of the sunlight as the sun sinks behind the tree line is still the best and, producing keepers, but the opportunity for trophy walleye or northern pike is ever-present. Look for panfish on mid-sized lakes to be in and out of the weed lines with patches of soft bottom in them. Be sure and check the rims off shoreline structures leading into deeper water. On smaller lakes look for fish to be sliding into these deeper water basins to feed on bugs and other forage that attract hungry fish. Use this “deep hole” strategy as a good starting point to drill a line of holes to look for suspended fish on the sonar. For you traveling fishermen, if it is an option, trailer up the snow machines and hitch on portables rather than a wheelhouse. It is good to be mobile. Stay at a resort or hotel/motel and live it up. We hope to see you on the ice! As always, remember to keep it safe this winter and because we here in the Grand Rapids area are fortunate to “be in Minnesota’s nature,” please share our good fortune by introducing someone new to the outdoors. When you're using small jigs to catch panfish, no matter which lures give you the most advantages, chances are good that they're valuable and that you'd like to protect them. Removing an impaled jig from a fish using a foreceps, or pliers can be time consuming and it can cause the paint to flake off, sometimes even break the hook shank. Not to mention being hard on the fish. 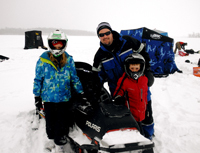 (1/11) Lately Ice conditions in the Grand Rapids area are currently ideal for travel by snowmobiles, ATVs, side by sides with chains or tracks and some area lakes are now supporting light vehicle traffic. Because of the sheer numbers of lakes in the area and the diversity of fishable waters, check with bait shops and resorts for the most current updates of ice conditions on the lakes you intend to fish. As always, watch out for slushy spots. Bluegills and crappies have been biting in weedlines from 8-12’ and holding off steep ridges nearby. They’re also starting to school up in deeper holes so check your lake maps for the deep basins. When fishing for panfish, try to use light “noodle” rods as these will help detect these soft biting fish. Also, downsize your lure presentations and be sure to bring along wax worms and small crappie minnows. Waxies have been best for bluegills. They have also been better for crappies when they have been on a negative bite, be sure to have both small minnows and waxies for crappies. Walleyes and northern pike are still active and biting best during the low light periods of the day, such as the first hour and last hours of daylight and on cloudy days. The evening and into dark bite has been the most productive. Locate shoreline structure that is adjacent to deeper water such as underwater points that drop off quickly into deeper water. On deeper lakes such as Pokegama Lake a good starting point would be points that slide into 20-30’ of water. On larger lakes like Big Winnie look for the 18-24 foot humps that drop into 30’ of water to find feeding walleyes. Jigging spoons or rattle-spoons tipped with a shiner head on one rod and swimming a full minnow under a “bobber” rod or “dead stick” have been the best presentations for both trophy and eater walleyes. Tip-ups with larger sucker minnows have been producing some great pike. Perch are still being found in shallow water gravel flats and remnant weeds that hold forage. Move farther off these shoreline structures to gain some depth when the shallow bite slows. Sometimes “running and gunning” works best to find active perch as well as nicer jumbos. The deeper water humps and breaklines from 18-28’ feet of water will house more condensed schools of perch. Also, listen to Rod and Nik Dimich talk winter fishing by tuning into 95 KQDS at 8:40 a.m every Friday and listen to Dimich Outdoors and the winter fishing report on the KQ Morning Show. Last week Nik talked about ice conditions & darkhouse spearing and today Rod will be covering ice conditions in the area and midseason panfishing. (New Year 2014) Lately we have pretty much had only three types of weather: cold, colder, and really, really cold. Oh, there were a couple days with warm temps, but then the big winds of last weekend blew in “Old Man Winter” on Sunday and temps fell off the table and went below zero all day and well below zero at night for the last few days. Every lake’s ice sheet has been freezing differently this December, leaving a variety of slush conditions above the ice sheet and in-between the snow pack. Due to the vast range of ice conditions, I’ve been taking our clients walleye fishing up to Upper Red Lake because of its safe ice travel and a pretty consistent walleye bite during the day. 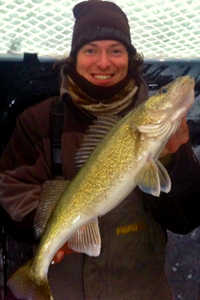 On Upper Red we have been finding walleyes active in 11-12’ feet over the last week. The bite has been about 50/50 between jigging a rattle spoon or a spoon tipped with a shiner minnow head and letting full chub or smaller shiner swim freely on a dead stick (or under a bobber). At times jigging aggressively has created an action bite, however, I’ve noticed that sometimes downsizing our presentation (tackle size) has helped us trick more fish into biting, especially when the walleyes are in a neutral/negative-feeding mode. Along with Upper Red Lake I’ve had clients on Bass, Ball Club and Pokegama Lakes. Each lake, as well as many others, are plenty safe for snowmobile travel and wheelers or side by sides with chains or tracks to help push through snowdrifts or the problematic slush. However, keep your eyes peeled for grey and depressed snow since there are still pockets of quicksand-like slush to avoid. If you have a chance to run to your fishing spot before packing up all your gear I would recommend it. Also, check into your local bait shops and resorts on the lakes you intend to fish as they’ll have the most accurate ice conditions because travel conditions change daily due to wind blown snow and new slush caused by vehicle migration. If you’re interested in a fully guided fishing or spearing trip this winter in the Lake Winnie or Grand Rapids, MN area please contact us www.DimichOutdoors.com we do still have openings available. Be safe and have a Happy New Year! - Fulltime fishing guide Nik Dimich . (12/27) A New Year, a New Phase of Ice Fishing - As we head into the New Year, we also are entering a new phase of ice fishing: more ice, better ice and safer ice. 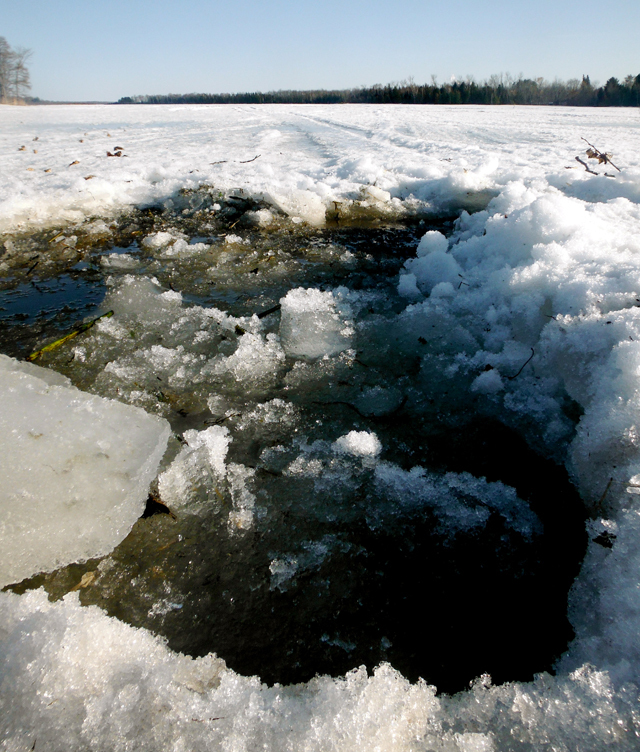 These new ice conditions will definitely lead to better and more ice fishing opportunities. Currently, some of our larger lakes are now accommodating light truck travel and even wheelhouses. Just be sure to check with local resorts, bait shops or sporting goods departments. Your best and safest access still remains by foot, but snowmobiles and ATVs are close behind with snowmobiles having the edge as they float over the snowdrifts, whereas ATVs plow through and are more susceptible to getting hung up. If possible, put chains on your ATV’s rear wheels, but remember, once your wheeler is hung up, the chains will not help. Carry a small shovel to get back to ice contact. Fishing action remains strong. Late afternoon walleye and northern pike bites on larger lakes like Pokegama and Big Winnie have been solid, with Pokegama offering up its usual trophies in both categories. Spoons tipped with shiner minnow heads have been the best choice for jigging while a lively fathead chub has been the ticket for bobber fishing. And for those lunker Pokegama trophies, don’t be afraid to put out a tip-up with a larger sucker minnow. Perch are still cruising the shallows, frequenting the remnant weed beds and sandy/gravel flats in eight to ten feet of water. It won’t be long, though, maybe in a week of two, until they head to deeper water. Smaller jigging spoons with a “crappie minnow” or waxies have produced good numbers. Be patient, however, as the smaller perch are currently much more active with one out of four caught being a keeper. Panfish have pretty much slid into the deeper holes, which are their winter haunts. Instead of fishing in the deepest part of the hole, try to focus on the rims as the crappies and bluegills will follow the forage that lingers there. Again, be sure to check with area bait shops, sporting goods departments and resorts for the most current ice conditions and fishing tips. Good luck fishing and have a great New Year. - Fulltime fishing guide Nik Dimich . Those of you who are familiar with or live with hunting and fishing people know what I am talking about. You probably have noticed for years that when October arrives something happens to those people who call themselves “outdoorsmen and women.” They change like a werewolf in the full moon. They are also easy to pick out of a crowd. How do I know this? I know because, I confess, I am one of that ilk. Why are we so identifiable? Well, first of all, we are a little obnoxious at this time of year, becoming a bit giddy and rambling on about this outing or that. So, please bear with us over the next couple months. Secondly, and maybe sadly, we will appear to be a touch shallow and turn every conversation into one about hunting or fishing. You can set your watch on it. No calendar is needed, just a hint of cold in the air, turning leaves and those sweet and acrid heavy smells of fall. We also come in many shapes and forms. We are the co-workers coming in late to the office from the duck blind or cutting out early in the day to climb into the bow stand. We are family friends or members who every time we cross paths with you will either be wearing our “colors” (camo or blaze orange) or will be demonstrating our passion about the outdoors in wild gestures like swinging our arms to show ducks cupping in or a grouse rocketing or holding our thumbs to our temples and spreading our fingers indicating a rocking-chair racked buck. We will also pretty much talk only about, and I mean only, hunting and/or fishing, with, of course, the mandatory telling of a few lies (to protect treasured turf or techniques). A good example of this is a longtime hunting and fishing friend who has come to our cabin turned duck camp every fall since we were in high school to hunt ducks in the morning and fish for walleyes in the afternoon. On the first night at camp he’ll talk hunting and practice his duck call late into the night while the rest of the camp is trying to get some shuteye in preparation for the much looked forward to next morning’s sailing in mallards and the jetting sounds of early morning ringnecks cutting over the blocks. Yup, even though none of our decoys are wood (they are collectors items now) we still call them “blocks.” And, as every duck hunter knows, the reason ducks give a look at your “hide” (blind) is because of the well-placed “blocks.” It is mandatory, of course, that said blocks be argued over and moved several times. It is also a requirement that any “kissy-faced” decoys be separated. We call this the “no PDA rule,” no “public displays of affection” between blocks. Folks like us are spread out all across the Northland. Where there is a marsh or grouse trail we will be there. Where acorns drop and clover grows we will be there bow hunting. Where crappies school and walleyes swarm, we will be there. Just don’t ask where. Speaking of crappies and walleyes, here are a few tips to help you put some fish in the boat this October. First of all, now is time to put away the rigs and spinners. Oh, you might catch a few on them, but for maximum success, it’s time to bump and swim the jig. If you are fishing for crappies, remember the size and presentation of your jig is paramount. When the water cools into the low sixties, crappies head to the deep shoreline breaks and structures, so be sure to have a heavy enough jig to get your bait into the strike zone. Although conventional wisdom might suggest lighter jigs for panfish, that only holds true in shallow water. When hovering and jigging in deep water, it is important to have at least a 1/16th ounce jig and sometimes even an eighth. When you locate fish on your Lowrance or Humminbird sonar unit, instantly mark the spot into your GPS, and, even more importantly, throw a buoy. The buoy will not only help you stay closer to the pod of fish, it will give you a reference point. Sometimes the schools will move only ten or so yards, but if your screen goes clean, you need to find them again. Once found, hover over the pod of fish with your trolling motor (big motors just won’t cut it here) and vertical jig. Keep in mind, you won’t feel the “doink” when you’re jigging, you’ll feel it by finding the bottom and lifting up two or three times a few feet up and holding your bait there for several seconds. The bite or “doink,” if you will, will be like a slight thud. When this happens, set the hook by slowly lifting up, rather than flaying away like the Minnesota Twins in their record setting strikeout season. Use 1/16th or 1/8th jigs, tipped with small crappie chubs, but always bring some mediuim/large chubs too. There are some days one definitely works better than the other. Artificials, like plastic tails and minnow shapes and waxies will also work wonders as they flutter slowly on the drop and allow more time for fish to strike. And don’t forget that the traditional bobber technique is always great for panfish, especially when anchored or hovering with your electric motor. Bobbers don’t work well, however, when drifting or trolling, as you’ll have to constantly reel in and recast the bobber to keep up with the moving boat. As for walleyes, because this is a much later occurring fall than average, traditional fall fishing techniques are just beginning. 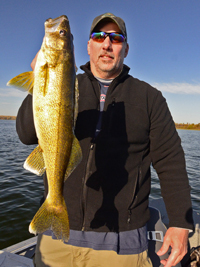 Walleyes are starting to bite best on a jig and minnow off shoreline structures, weedbeds, rocks and shallow mid-lake flats and bars. You’ll want to work these areas by drifting slowly or backtrolling with your big motor or electric motor. I also like to use a drift sack when backtrolling with the big motor or during a controlled drift with the electric motor to control my boat position and speed. This will work in any size of boat; I’ll use this technique in both of our 20’ Lund boats, either our double counsel/windshield Lund Explorer or our Lund Alaskan tiller. Have a great beginning of October and if you see me wearing my “colors” and wildly telling a story, remember, like Percy Garris (Strother Martin) said in the movie, “I’m not crazy, just colorful.” - Fulltime fishing guide Nik Dimich . Fall is officially here (9/22/13 is the autumnal equinox) and even though our weather calendar is seemingly running a bit late (about two weeks) our seasonal transition has begun. Last Thursday’s rain was the beginning of the end of summer. Now is the time when we “Northlanders” have an opportunity to view change from Mother Nature’s perspective. Like Russian author Leo Tolstoy once said, “True life is lived when tiny changes occur.” For us, fall is full of tiny changes in the outdoors. For duck hunters, this is it, the beginning of duck season. Now is the time all waterfowl hunters have enthusiastically waited for and each morning in the marsh over the next several weeks will be worth the wait. This fall might be a little different than most, however, with lower than average water levels and more wild rice than usual for this late in the season. Local ducks and geese that frequent our region will once again see hunters in their traditional hunting spots and camps for opener. And when they wing south on their mysterious and magical ancient migration paths, northern ducks doing the same will filtered down as the season progresses. Those flights, which arrive before the “big flight” comes down, called as Gordon MacQuarrie famously labeled them, “the little flights” are the very essence of what waterfowling is all about. There are just enough birds to get you out of bed, but not too many as to spoil you. For fishing people, angling action this fall will only get better as September presses on with consistent cooler nights and days dropping our area water temps into the low 60s. This will start a movement of fish into traditional structured areas that will create larger schools of active fish. This is when the classic jig and minnow bite on shorelines and rock structures will begin. Because our spring was so late this year, this timeline will be occur a little later as we head into fall, so be patient. Our forests are good indicators. When they are still thick with green leaves and foliage, as they are this year, the vegetation that grows under our waters will be the same. Most of the weed beds are still thick and green and standing and will continue to be so until things really start to cool down. Watch the trees. As they color, so will the underwater vegetation whither. So far, this underwater green has affected walleyes, keeping them holding tight in weed beds over the last few weeks in the shallows from 6-10’ on the inside or outside of the weed beds or right in the thickets. These weeds are loaded with young of the year perch and when you clean a walleye caught there they will appear to be like little footballs, plump full of perch. The deeper weed beds are also still present on steeper shoreline lakes in our area, like Pokegama for example, and will continue to offer healthy “veggies” in depths up to 15-19’ of water. 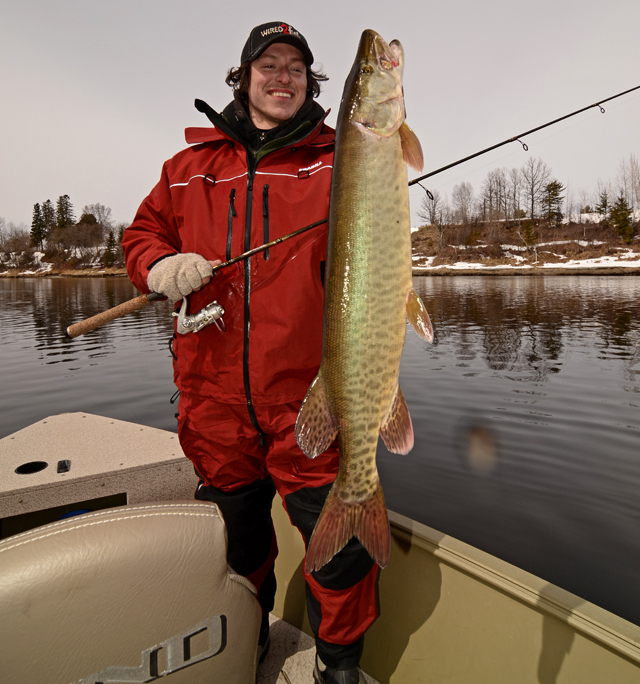 Currently, both shallow and deeper lakes are offering a mixed bag of northern pike, walleyes and even muskies. And don’t forget about fall crappie fishing, the cooler water temps will soon house massive schools of crappies suspended in deep water, which will be easily located on your sonar. When you do locate these suspended crappies (they will look like a yellow/red blob or Christmas trees) try hovering over them with your electric trolling motor and vertical jig them with a jig tipped with a crappie minnow or a piece of crawler. Use light “noodle” rods and four pound test line for maximum feel. For grouse hunters, this current forest canopy is creating an extreme challenge, as grouse are able to hunker down in the thick smother until the leaves start to drop. Don’t get me wrong, however, there are lots of grouse out there and you’ll hear the flush, you just might not be able to locate the bird. If you do shoot from a logging road, for example, mark your firing spot with something blaze orange so you have a reference point. And don’t forget a compass. The green shadows all look alike, especially on cloudy days when there is no sun for a reference. For hunters with dogs, the heavy green really doesn’t make much of a difference, as the dogs are happy just to be on the scent of a grouse. For the grouse hunter, with or without a dog, just being able to sneak a grouse trail on a given day in hopes of hearing a flushed bird is considered a great day.
" - Fulltime fishing guide Nik Dimich . 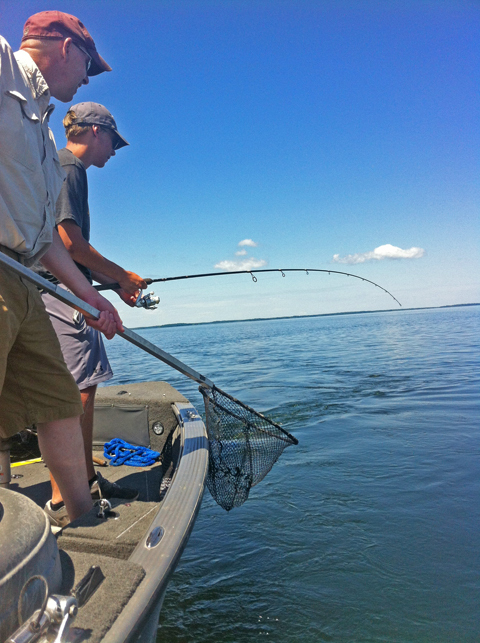 (9/19) Nik’s Tips From The Lake Winnie Region; "Cold water jigging - Let’s not get confused. In fishing, “jigging” is not the dance done by Billy Crystal when gold was supposedly found in the 1991 movie “City Slickers,” a take-off of Walter Brennan’s dance in “The Treasure of the Sierra Madre” (1941). “Jigging” should also not be confused with “gigging,” a fishing method most associated with spears and frogs. No, “jigging” is the time honored method of fishing involving a lead-headed hook. Even though it seems like it has been forever since the “jig” bite has been a thing, what with the spinner being king of the water as of late, the jig has really not completely gone away. It has just sat on the bench for a while, so to speak. If a jig “could” speak, however, it would now say, like that loveable former California actor/governor once said, “I’m baaack.” Everyone knows, of course, that action movie hero/politician was Arnold Schwarzenegger (try spelling that without looking it up), but did you know the former gov/movie icon earned a bachelor’s degree (international business and fitness, go figure) from the University of Wisconsin-Superior? Yup, he did. Yes, the return of the jig has come. Although its return does not have the same fanfare as “Return of the Jedi,” for the spinner-weary fisherman, it is as welcome as Episode VI was to “Star Wars” fanatics. Yes, the jig’s return is here and its arrival coincides with that time of year we who have tired of deer flies and mosquitoes and humidity have long waited for… fall. Those initial fall smells are finally here and they are as welcome as the smell of fried onions and cotton candy were at the county fair. This change of season, of course, is highlighted not only by the great colors, but also by cooler days and nights that will cause the water temps to soon be in the 60s and heading downward. This transition will offer a more consistent bite for walleyes and other swimming predators putting on the cold-water feedbag. It will also trigger two migrations. One will be the minnows and young of the year perch heading to the shallows to be followed by the walleyes and perch and northerns. The second will be just the opposite, the panfish (crappies and sunnies) will head deeper toward their winter haunts in search of a protein rich diet of bugs and tiny minnows and such. So, how do you catch these cold-water fish? Let’s start with walleyes and perch and northerns. One of the most effective ways of catching cold-water walleyes is jigging with a minnow. Although a crawler and leech might have worked in warm water, they come in a distant second and third when the water chills. Think spring when fall comes and use all the same jigs you used then, and, for the most part, many of the same locations you fished then will again be golden. There are, as to be expected, a few key differences. 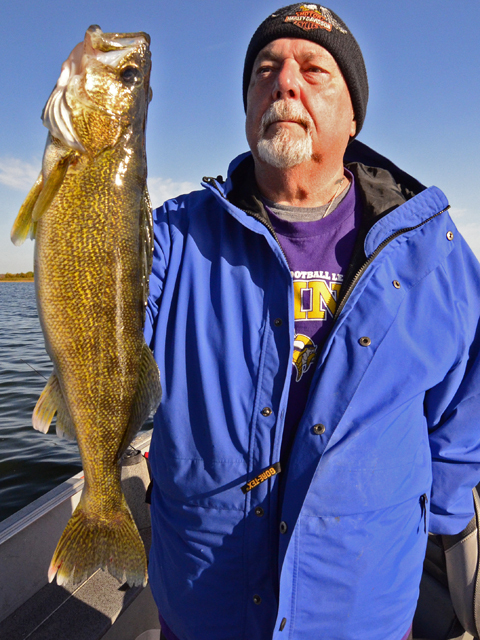 One is, cold water sometimes makes walleyes a little bit sluggish. To compensate for this, slow your boat speed way down during a drift or troll and vary speeds. I like to use a drift sock to help control my speed and have several to choose from. The size I use is dependent on wind conditions and how I choose to fish, drifting or trolling. I use either my big motor or my electric trolling motor to find the best speed. I also like to use my electric and the drift sock to control my drift location and speed. Because fall fish are usually spread out over rock and sand flats, covering a lot of water and jigging over these structures will work wonders. For panfish, the opposite is mostly true. Once they are found in deeper water, it is best to hover and vertical jig. One key to catching fall panfish is to have faith in your sonar. If the screen is clean you might as well be fishing in a bathtub. When looking for structure to fish in cold water, look for hard bottoms near rocks or adjacent to shallow underwater points. This could be as shallow as 5’ or as deep as 15’. I have found that sometimes walleyes and perch go a bit deeper in cold fronts and move shallower as the day and water warm. As far as colors are concerned, you can always go by what Ralph (the “Outdoorsman”) Carlson always suggests, “Use bright colors on dark days and dark colors on bright days, and if that doesn’t work, switch them.” Actually, I think hook length and jig weights are as important, maybe more. The slower and shallower you go according to wind and boat speed, the lighter you can go. The faster, the heavier. Also consider hook lengths, of which there are basically three: the shorter snub-nosed type, the mid-length and the long shank. The shorter hooks work best when the fish are biting “short” because there is less minnow to chomp on. With these it is best to set the hook quickly. When using the longer hooks, try hooking the minnow through the mouth, out the gill and back through the body rather than just through the lips. Also vary your hooking techniques from top to bottom, bottom up and even from the sides. The same also holds true for panfish. Don’t get me wrong; there will still be fish biting in the weed beds with hard bottoms. When fishing there, try fan casting your jig and minnow into the weeds and slowly work it back towards the boat. While working the bait back, the key is to move it slowly to avoid getting hung up in the weeds, slowly lifting and letting the jig fall. Finding a motion that is successful and then replicating it will have fish picking up your bait on a consistent basis. Have fun fall jig fishing and if you see me dancing like Billy Crystal or Walter Brennan in the boat, don’t assume I have spent too many days on the water, think I have found the “one thing” Curly (Jack Palance) talked about in “City Slickers” and that “one thing” was the right jig and presentation." - Fulltime fishing guide Nik Dimich . (9/11) Nik’s Tips From The Lake Winnie Region; "American novelist Henry David Thoreau once wrote, “Time is but the stream I go a-fishing in.” I agree. Since this time of year is full of outdoor tradition, an important element we fishing and hunting enthusiasts draw from when planning for an upcoming fishing or hunting outing is to remember past experiences. We do so to not only redo those that worked, but to avoid those that did not. If we are planning for a fall fishing outing, for example, we will probably pattern our trip according to how and where the fish bit in the past and what presentation worked best. Just like in football (go Vikes) a game plan is needed (and maybe a quarterback). With the cooler air and water temps, we know walleyes are now swimming to their early September patterns. 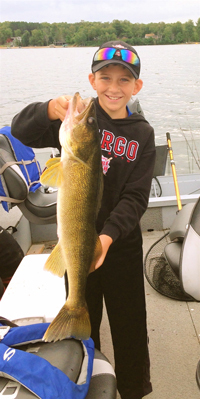 By “fishing memories” we assume a jig and minnow will be key in catching the wily walleye. We will also remember how we caught fish on the rocks or shoreline sand flats because they held plenty of forage for big schools of feeding fish. The thing we have to keep in mind, however, is that there is a big difference between remembering “fishing” memories and actually “fishing memories.” In other words have fun remembering, but don’t get married to your past successes. This year’s walleye and panfish transition has not yet occurred and until it does the fish will be scattered. This does not mean, however, that they won’t bite, they will. There will simply be more water between them. And since fish don’t feed all the time (which is one of the main reasons why there are plenty left to catch, the other is they swim) there will be a mixed bag of fishing and fishing reports. Because the bite will be inconsistent from one day to the next, covering ground is important. Trolling spinner rigs tipped with a crawler, leech or minnow or crank baits on these structures will help you locate active fish. When you do locate active fish, don’t keep going, either buoy up or punch in a waypoint and stay close and work the area until the bite goes negative. And don’t be afraid to change it up once you find the fish. Not long ago I saw some people fishing perch on scattered rock humps. To find active fish, they ran spinners, but when they found the fish they switched to a jig and minnow and fan-casted the school with tremendous success. September is a classic month for both memories and tradition. Everyone remembers the exciting yet anxious first days of school, the opening high school football games and band performances and the smell of fall in the air. And who can forget what our trees look like as their leaves transition from the various shades of green to the incredible bursting kaleidoscope of color as they near their color peak. Yes, a frosty fall might be soon approaching, but there is still that great blend of late summer and early fall weather to go through. Whether we receive these gifts from nature by fishing or hiking or grouse hunting or simply taking the “scenic route” home from work, it doesn’t matter. All that matters is that we appreciate the simple beauty and pleasures offered to those of us who live in a four-season world. Now, I don’t expect you to break out and sing like Barbara Streisand of the “misty water-colored memories of the way you were.” But, it you get a chance, find the time to dig out some of the “scattered pictures” of the way you were and share them. If you do, these scattered pictures of the “smiles” you left behind will help others smile. And even if you don’t share them, they will definitely make you smile. When I see the photo of my Grandpa and me and a sparkling black crappie and a little lake rimmed in yellows and oranges, I smile. When I look at duck hunting pictures from the past of my dad and me, I hear ‘bills cutting through the early morning sky like a jet coming in for a landing, I get the shivers. When I see a picture of me with my first grouse and my dog “Hunter,” I remember how it rocketed into a water-colored woods and how excited “Hunter” and I were when I shot and it fell. I also remember how much a dog can mean to a young boy and how much I miss him. These and many other images rest securely in the corners of my mind. They are things I surely will never forget. Take the time to not only share your memories, but to create more. And don’t be afraid to dream either. Dreams are what make memories." - Fulltime fishing guide Nik Dimich . (9/4) Nik’s Tips From The Lake Winnie Region; Labor Day…a labor of love. - The famous Greek philosopher Aristotle once said, “The end of labor is to gain leisure.” I agree (maybe we all do). This is why Labor Day is not only a great holiday for the common working men and women, it’s also a day to say thanks to workers current and past who have participated in labor unions and eventually received many of the workers’ rights we enjoy today. We can thank the industrious workers from our past for not only this day off, but also better working wages and safer working conditions. Accordingly, we should also thank the employers who provide the employment for without them there would be no work. The dictionary defines the “labor of love” as “A labor voluntarily undertaken or performed without consideration of any benefit or reward.” However, when this involves anything to do with the outdoors, everyone involved greatly benefits and is rewarded, just not monetarily. There are exceptions, of course, like removing a hornet’s nest or an old fence’s barbwire, but still, these types of outdoor labor can be rewarding. Walleyes and perch, on the other hand, have been in the transitioning mode from the deeper flats to the shoreline veggie beds of thick submerged weeds and areas with sand grass and shallower mid-lake structure that holds forage for feeding fish. Perch have gone to the “crayfish” buffet and can be found on most rock bottoms. The northern pike will also be there, for where the forage perch go so go the pike. The only drawback is that you may have to “farm” lots of ground (water) and cover extensive sand shorelines and mud flats to locate active fish. When the early goose season opened (September 1) it was preceded by above average warmer and totally unseasonable erratic weather. These high temps brought on a late summer humidity blast that has somehow magically hatched more deer flies and mosquitoes making not only goose hunting and fishing a bit more challenging, but bear hunting also. Since covering your scent isn’t a concern in the goose blind or fishing, it might be a good idea to carry some bug spray. And speaking of the warm weather, because the water temps have gone back up dramatically keeping fish alive in the livewells is once again a problem. The solution is to bring an old cooler (don’t use the family cooler) filled with ice and use that to keep and transport your catch. Bear and goose hunters should also consider the recent heat and humidity and adjust accordingly in the fields and deep woods. Cool your take as soon as possible and watch out for protein hungry hornets because that protein might be you. Again, a big thank you and salute go out to the working people and their employers on this holiday dedicated to what makes our country so great…the desire to work and work hard. Even though you might not agree with all of what is presented in John Steinbeck’s classic 1939 American novel “The Grapes of Wrath,” it is pretty hard not to be moved by what Tom Joad says and Henry Fonda made famous in the 1940 movie when he says: “I’ll be in the way kids laugh when they’re hungry ‘n they know supper’s ready. An’ when our folks eat the stuff they raise an’ live in the houses they built why, I’ll be there." - Fulltime fishing guide Nik Dimich . When I first heard the “Happenings” song “See You In September” played on a cassete tape player at our cabin, my buddy Mike Edminister and I thought it was about the upcoming fall hunting and fishing. After all, to our families August has always meant September and our fall hunting seasons were near. There is just lots to do when the days and evenings and water cools and the leaves transition into color and there is a very short window of time in which to do it. Which do we choose to do? The answer lies basically in what the legendary baseball player Yogi Berra once said, “When you come to a fork in the road....take it.” In other words, do as much as you can. On the fishing report side, because of the recent hot spell, most area lakes are blooming and this “pea soup” look brings fish into the shallows and around the weed lines because of the low light density and the abundance of bait. Live rigging these spots with spinners tipped with a crawler or minnow has been the ticket to an action bite. Depending on how thick the weed cover is and depth you are fishing, the sinker weight and trolling speed will vary. At a slower speed a lighter bullet or barrel sinker is key, so try a 1/8th ounce sinker and work at a speed around .07 to .08 in shallow. If you go deeper, use a touch heavier sinker 3/16-1/4 ounce and if you are over thick cabbage quicken your pace even though you might think you are racing like Burt Reynolds (the Bandit) in “Smokey and the Bandit.” The faster speed will keep your rig above the weeds, so don’t be worried about hitting speeds from 1.5 up to 2 mph. And don’t be afraid of Sheriff Buford T. Justice (Jackie Gleason) either, unless you are in a “no wake zone,” then watch out. Also, at this time of year remember that the old jig and minnow combo will again work wonders. Keep in mind, however, that fishing in the weed thickets will strip your minnow nearly every cast if you’re not patient. Pitch a light 1/16 or 1/8 ounce jig into the weed lines and let the jig slowly drop and then work it back toward the boat at a slow speed, like a snail. Also, lift the jig off the bottom, once, twice...then drag slowly. After lifting the jig off the bottom pay attention for a bite, it’s amazing how many walleyes or crappies will hit the bait on the drop. This presentation will slide through the weeds without getting hung up as often. Speaking of forks in the road, as of August 16, bear hunters have been able to bait for the upcoming bear season opener on September 1, 2013. September 1 is also opening day for early goose season, when hunters will be able to hunt over land and water. Shortly after this, our future waterfowl hunters will have the opportunity to hunt waterfowl as the Youth Waterfowl Hunt is Saturday, September 7. This is a great opportunity to introduce and teach youngsters about the joys of waterfowling like the “old duck hunters” have enjoyed every fall since their youth. The first time I heard that (on a cassette tape, mind you) was on our way duck hunting and it was pure music, duck music. I have never forgotten it. After the youth opener, there will be grouse hunting and archery deer seasons which open on Saturday September 14. And, speaking of deer hunting, what better time than now to get your trail cams out and begin scouting? Be careful about attractants like blocks, powder and liquid supplements, etc., however. Just because you can buy them doesn’t mean they are legal to hunt over. To be safe, if you are uncertain, remove any attractant ten days prior to hunting. And finally, remember the waterfowl opener on September 21, the earliest it has ever opened. More on that later. So, enjoy the last weeks of summer and have fun getting ready for early fall. It is what MacQuarrie calls, “the wedding of the seasons, the perfect blend of warmth and chill and sun and frost.” Also understand what my Grandpa always says, “Sometimes the anticipation and preparation for a fishing/hunting trip is the best part,” and remember, the best time to fish or hunt or be in the great outdoors is when you can, and be sure to take a kid with you." - Fulltime fishing guide Nik Dimich . (8/19) From the Grand Rapids Region, Nik Dimich says; - The legends fish on . As I write this story, I feel like a modern day Huck Finn. Not that this is about the Mississippi River or a raft or runaways. It isn’t. Instead, it is a story told to me about three veteran fishermen from Grand Rapids who left one Sunday morning two weeks ago to fish the deep waters of Lake Superior for the hard to get trout and salmon that swim there. I am thinking you are by now humming the tune, so here is the opening line: “The legend lives on from the Chippewa on down of the big lake they call Gitche Gumee.” I now apologize to those of you who will go to sleep tonight still having Gordon Lightfoot’s melody play over and over in your mind. But, back to my fish tale. Because the lake was named “le lac superieu” by 17th century French explorers, it is fitting the leader and Lake Superior fishing expert of this Grand Rapids fish pack is of French heritage, the renowned Tom (“Pelts”/“Putty Arm”) Peltier. The second, Ralph, “The Outdoorsman” Carlson is a Swede, but because he skated so slowly he gained a French nickname from his buddy Jim Dixon: “Guy (pronounced ‘gee’) Le Turtle.” The third should have been Brian “Hink” Titus, but he was trying to become “husband of the year” white-knuckling traffic in the Twin Cities to attend a family wedding. Because he can clean fish, the senior member of Dimich Outdoors (actually there are only two of us) my dad, Rod Dimich, replaced “Hink.” As my dad jokingly tells it, he was blindfolded as they approached Duluth so he wouldn’t be able to tell the rest of the area guides the location of “Hink’s Hole” on Lake Superior. As the story goes, the winds of July were strong from the northwest, but because they were protected by high jagged cliffs (does that give you a hint where they were?) the waves were very manageable for Tom’s 1900 Lund Pro V.
At the “secret” landing, the three amigos (“amis” in French) found only two other rigs and a DNR creel census taker who Ralph said looked as lonely as a “Maytag” repairman, whatever that means. The DNR guy said a huge cold front and wind had pushed the warm water out. I guess Pelts and Ralph nodded in agreement like they knew what was going on while my dad whined about taking off the blindfold, which they did so he could back the trailer in. Those of you who have been on the North Shore or fished there will know what I mean when I say there is nothing quite like it. Some of my best fishing memories have come from the beautiful spring days chasing steelhead in Lake Superior’s feeder streams and rivers with fishing buddies Mike Glorvigen and Ryan Miskovich. In addition, some of my most interesting fishing conversations have been with the fishing tournament and industry famous and hugely successful Greenway/Grand Rapids twins, Scott and Marty Glorvigen, founders of the Gemini Corporation. When you see the excitement in their eyes and listen to their endless collection of fishing facts and stories you know fishing is more than a business for them, it’s what they have really liked to do since they were little kids growing up on Pear Lake. Lake Superior makes you feel very small, very fast. What was the fishing report? Without giving away too many secrets, the water temp was 48 degrees, they only saw three boats and one was carrying taconite. My dad freaked out when “Pelts” hollered out orders to quickly raise the electric downriggers, as they were getting too “shallow.” With thoughts of the “Rock Pile” on Bowstring, my dad jumped to the rigger only to find out “shallow” meant 140 feet and the 10-pound balls were set at 150 feet. If you haven’t fished with downriggers, let me tell you it is strange. Your spoon is tipped with a 10-foot leader and clipped with a clothespin type of thing just above the ball. When you lower the ball you are able to fish straight down into depths of around 150 feet. While you do, your rod is bent in half and when a fish hits instead of the rod bending more, it actually straightens up as the clip comes off. Weird, huh? Did they catch fish? They did, eight lake trout ranging from three to five pounds, releasing one. Did they lose a big one? Yep, the “fish cleaner” forgot to loosen his star drag and tried to “horse” one in. Did they argue like “Grumpy Old Men”? Of course, when you reach a certain age you know everything and your motto is “Tell me something I don’t know.” Any incidents? Again, of course. Pelts and Ralph glossed over it, but the “fish cleaner” did fess up to me he might have gotten the landing net tangled up in the sprocket of the downrigger as it went down, well, a little down anyway. There’s more, but you’ll have to ask the fishing amigos when you see them. In ending, I would like to publicly thank Ralph Carlson for not only helping mentor me and other “young fisherman,” but for being the outdoor voice of the “Grand Rapids Herald-Review” for over 20 years in his very popular weekly column “The Outdoorsman.” Ralph was to people my age what Ken Hickman was to readers my dad’s and Ralph’s age—priceless". - - Fulltime fishing guide Nik Dimich . (8/6) From the Grand Rapids Region, Nik Dimich says; "On Pokegama, you mostly hear about the lake’s night bite or the late evening flurry. We hear about it, however, because that is when most of the fishing people can find the time to get on the water. Sure the late bite is probably better for larger walleyes, but great fishing can still be found at high noon. ... the group was pleasantly surprised at the numbers and size of the fish their family, especially the kids, caught with us during the daytime. Most of the fish were caught >> " ... Read >> Lake Winnie Region Fishing Report . (8/6) From Wired2Fish; "I have a huge appreciation for versatile bass fishing lures. The fewer baits I need to catch big bass, the more efficient I am as an angler. I’ve been using the Yum F2 Dinger for years and it has quickly become one of my “go to” baits for every season. 4 characteristics make this bait one of my all-time favorite soft plastics. ... >> Learn More Click For Review of Yum F2 Dinger . Even though our end of July full moon has passed, making way for the last quarter of the moon phase to start on Monday July 29, summer is not even close to ending. In fact, those who like fishing summer’s warm waters are in for a treat, even though the bright moonlight won’t be back until the 21st of August. Never the less, enjoying the wonders of the moon aside, there is still not only plenty of summer left but lots of fish to be caught, even during the day. One phenomenon we have witnessed lately is that with the cooler nights and cold fronts, our Northland’s water has correspondingly cooled during the morning hours. Because of this, many fish species have been reacting by scattering. Large and small lakes as well as large and small fish are similarly affected. For some reason, and I don’t pretend to know the answer, the fish go into their disappearing act. This is the time to return to what our ancestors did, become “gatherers.” This is the time to eat some humble pie and go for the action bite. It is the time to realize there are more than one species of fish in the “sea.” Swallow that pride and enjoy the “gathering” technique and the bent rod action that comes with it. What my Grandpa always says about deer hunting for bucks (antlers make poor soup) holds true for those of us who seemingly need to always fish the “walleye”: releaser fish are nice, but they make for a poor shore lunch or dinner. A good case in point is the approach renowned professional fishing guide Jeff Sundin takes. His philosophy is “gathering” has many rewards, not the least of which are smiles all around twice, once at the steady action and once again at the fish fry. When the dog-day doldrums appear, Jeff heads to where he knows fish will be, the shorelines and the vegetation (he calls them the “veggies”) that rim them. Variety is the spice of fishing this time of year. Search out lakes that hold multi-species of fish, especially when the going gets tough in August, and catching a mixed bag will be relatively simple. Spinners tipped with live baits like crawlers, minnows or even leeches will produce action from most species of fish. Pull these spinners at slower speeds of .08-1.2 mph with smaller blades for panfish and speed things up to 1.5-2.5 mph with larger blades for larger fish and you’ll get lots of attention from our submerged friends. When fishing shoreline structures with these presentations, locate underwater points, rocks and weed beds and you will get more than enough of a mixed bag for a shore lunch or dinner. And when you do, you will be rewarded as the smiles from your family members or friends become memories. If you need proof, just look at the smile on my nine year old niece Mila Adams’ face in the picture as she “shakes and batters” fillets and you will know what I mean. Keep in mind there is more to fishing spinners than just simply buying a pre-tied spinner and tying on the end of your line. Even though I mentioned it before, I can’t stress enough how the smaller blades work better at slower speeds with lightweight sinkers above the swivel, especially in shallow water or above the weeds. Vary your weights from 1/8 or 3/16-ounce bullet sinkers to even split shots. Both will work to keep your bait above the weeds to lure fish out of the green smother since most fish are creatures of habit and will react to the common biological theory of being “sight predators” during feeding times. And, of course, if you speed things up, use a larger blade and go to a heavier sinker to keep your presentation above the weeds and/or rocks in deeper water. The best thing to do is go to bait shops or sporting goods stores and talk to their people. They really know their stuff and sincerely want you to catch fish. Finally, as you do “gather” some fish, and I am fairly confident you will, here are a few fish fry tips. When pan-frying fish remember the temperature of your oil is very important. If you have too much heat, it will burn. We like to have the oil reach 325-350 degrees before dropping in fillets. In addition, always be sure to ask if anybody is allergic to peanuts if your oil has some peanut base to it. To be safe, just use oil, not motor oil though, that has no peanut ingredients. Keep in mind when “gathering,” you “sell the sizzle not the steak,” as Cosmo Kramer said in Seinfeld. And one more thing, after you have your fillets battered, dip them in the bubbling oil with the skin side down (even if the skin has been taken off). Doing this will prevent your fillets from curving up like a cheese curl. Good luck fishing and remember to fish when you can and take a kid along if you can. If the kids can’t go fishing, let them help with the cooking. Instead of the Talladega Nights’ “shake and bake” you will have a northern Minnesota “shake and fry.” I know it doesn’t rhyme, but Bob Dylan I’m not." - Fulltime fishing guide Nik Dimich . (7/31) From Wired2Fish; "Some anglers never really get the chance to really “know” their boat. They think they do because they know how to operate it but some of the smallest details can turn into the biggest nightmares. Because so much is internal to the boat, under the deck and out of sight, unless it breaks there is no reason to look under the hood. One of the best ways to truly know all of the important details of your new boat is to rig it yourself. We recently had the opportunity to rig the new ... >> Learn More Click For Rigging Your Own Boat . (7/24) Nik’s Tips From The Lake Winnie Region; There’s fishing treasure everywhere - This past week on Lake Winnie, Molly Griener, owner of the Gosh Dam Place, and Northland Lodge owners Mike and Pat O’Reilley hosted the annual “Women On Water” fishing tournament. Launching and weigh-in were at Northland Lodge and the award/prize ceremonies were at the Gosh Dam Place. Pro fishing guide Tom Neustrom was once again instrumental in organizing the tournament.As far as tournaments go, this is a spectacular event. Its format is that of a multi-species tourney so there are winners in several categories, including walleye, northern pike and perch. There are also many, many raffle prizes donated by local businesses as well as the fishing industry. Like in any well-run tournament filled with quality fisher-people, there was a great deal of excitement as the final “leader-board” was announced. If you know any fishing women who would not only like to try their luck in a quality tournament, but would like to experience the camaraderie the fishing world offers, please contact the Gosh Dam Place for more information. It’s not only a wonderful tournament; it’s a wonderful experience. And if you’re fishing in the Winnie area be sure to remember the Gosh Dam Place will prepare your day’s catch for you complete with fries, coleslaw, beans, etc. Just don’t ask Molly to clean your fish. That’s not going to happen. Okay now back to the “fishing ranch.” We are now heading into the last week of July. The weeds are up, the water temps are in the mid 70s and we are losing 1-2 minutes of daylight each day. It’s late July and the sporting goods stores are now starting to feature portable deer stands and camo clothing and bows and arrows. Oh, my. But hold on. Summer is still here and it is a wonderful time of the year to be on the water catching multi-species of fish. Whether your fishing presentation is a bobber, a crank-bait, or dragging a live-rig or a spinner rig, you are “in the ball game.” All will work at certain times. Take the end of last week for example. As we fished out of Joe and Kelli Karau’s Williams Narrows Resort with the Daikin-McQuay group spearheaded by local guide legend Charlie Worrath, fish and fishing techniques were all over the place, literally. Fish were found not only on Winnie, Big Cut Foot, Bowstring, Ball Club, Pokegama, but also on a few more lakes that for some reason did not have names. Fishing varied between excellent to “scratching away at them,” like Charlie Worrath says. Believe it or not and I am sure you might think this is “guide-speak,” fish, including walleyes, northerns, perch and bass were found both deep and shallow and caught jigging, rigging, and spinning. Like Calvin in “Calvin & Hobbes” says, “There’s treasure everywhere.” And, fishing-wise anyway, there is. As far as fish taken by “out-of-towners,” the actual take is very minimal as these groups usually only keep enough for a “shore-dinner” because most have come in from long distances. The economic value of tourism far outreaches the value of the few perch, northerns and walleyes we fried up in Jason Boser’s and Charlie Worrath’s fish batter. And from the FYI department, be very careful for deer when driving, even when biking or on a motorcycle. If you have walked or jogged in the country lately you know the deer flies are everywhere, as are the horseflies. This puts deer on the move. There are also a lot of young fawns who are getting pretty frisky now and don’t know the ways of the highways yet. And if you are wondering why there are so many single deer being seen and hit, it’s because most of them are last year’s fawn bucks and the does chase them away as they raise their new fawns. 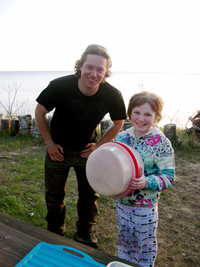 Enjoy the great weather and remember to take the kids fishing so they can find some treasures." - Fulltime fishing guide Nik Dimich . This became very apparent to me once again last Tuesday at the Bob Dylan and His Band concert in Duluth, MN on the waterfront at Bayfront Festival Park just steps away from Lake Superior. What an experience. The northland is famous for many things, but as far as people go, who could be more legendary than Duluth born and Hibbing raised Bob Dylan or Grand Rapids’ Judy Garland? So, how does all this connect to fishing and the outdoors? Where do I start? As I stood near the heavily rocked shoreline of Lake Superior within viewing distance of the Aerial Lift Bridge where ships and boats and canoes and kayaks of every size enter the harbor, I was awestruck by the incredible diversity that exists not only there, but in all of our northland. From the ocean “salties” to the “Tall Ships” that will arrive July 25-28, to the high jagged hills which rim the lake to the seemingly horizonless Lake Superior to the naturally air conditioned lake front, there are treasures to be found everywhere. No wonder people come from around our country and the world to visit and vacation here in the northland. I have conversations about fishing almost everyday, but at a Bob Dylan concert? Yes, I did. While at the show and amid the sea of people, I ran into and had a great time talking with Grand Rapids natives and skilled fishing fanatics Dr. Pete Miskovich his wife Molly and Ryan Davies and his wife “Mitch.” Even while the opening band “Wilco” rocked and concert goers drifted from vender to vender and spot to spot, we still had time to discuss not only Pokegama and Winnie walleye patterns, but the celebrated trout species that habitat the magical and mysterious waters of Lake Superior and its feeder streams. As we talked and the anticipation of seeing music icon Bob Dylan rose, it was really neat to see all the different water vessels. There were folks in kayaks, paddleboards, everyday fishing boats, a variety of pontoons and houseboats, all the way up to the big yachts and freight ships. Seeing this variety of watercraft reminded me that many locals in our area fish out of a variety of boats, like my cousin Corey Dimich and his buddy “Neighbor Jay” who do most of their fishing from kayaks or “yaks” as they call them or Jay’s trusty pontoon. Seeing these boats also reminded me of the wonderful world-class body of water we have right here in our back yard, Lake Pokegama. Except for the giant “salties,” we all agreed this boat show was like fishing Pokegama Lake on a busy day, lots of recreational activity on the water surface and great fishing below. 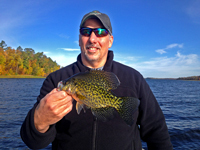 As many of us know, Lake Pokegama is much more than a wonderful recreation lake, it is a fantastic fishery as well, housing almost every fighting and savory fish our northland features. 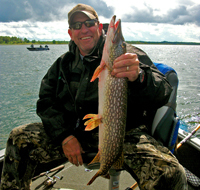 Long time area fishing guide Sean Colter and other local fishing gurus like the Olson and Davis families know you don’t have to go to Canada for trophy fish or an action bite. They are right here on our doorstep and you don’t need a passport or get hassled at the border either. And, like the Bayfront Harbor, there are boats of every size here. That is why the boating industry now offers a more diversified inventory. Remember when every lake home and cabin just had a fishing or skiing boat? Things have changed and for the better. Pontoons and ski boats are not your “father’s fishing boats” anymore. Many now come equipped and are laid out not only for skiing or tubing, but also to fish and fish comfortably. Each vessel is much more fishable and comfortable and safely constructed than ever before. Because leisure boating and recreation are major components of our summers here in Itasca County, as is fishing, check out the newer pontoon or fishing boats. Stop by one of our boat dealers here in town and see what they have to offer. You and your checkbook will be in for a nice surprise. What could be better than taking friends and family out for a nice day on the lake and still have the opportunity to fish? As far as “blowin’ in the wind” goes, lately it seems we have had either too much or too little. We were either rocking and rolling or fishing on a mirror. And what about the fog? The day the above photo was taken, the fog was so thick and soupy I had to use my GPS to go from Winnie’s Bowen’s Lodge to the north humps, but it was well worth it. After a bit of searching, we found a nice hump that housed mayfly larvae and the forage fish that seek them out. The walleyes were also there. Big and small. The dad and son who fished with me for two days last year and again this year had a fishing ball. Even though they could have taken home their limits of walleyes, they only kept a couple, enough for a shore dinner cooked outside their cabin at Bowen Lodge overlooking the vast and wonderful waters of Big Winnie. Longtime Bowen Lodge owners and hosts extraordinaire Bill and Gail Heig are strong advocates of catch and release and of keeping only what you want to eat. They are right as rain on this. If we want to preserve the fantastic walleye fishery we now have, we need to follow their lead. The days of the full freezer and fillet-packed coolers are gone and rightly so. Just look at Upper Red Lake and Leech Lake and now Mille Lacs Lake and see what “over-harvest” fishing and netting can do and has done. The answer my friends is “blowin’ in the wind.” It is also written in the “walleye chop” and it says, “You better start swimming or you will sink like a stone. The times, they are a-changin’.” Thanks, Bob. We agree. The fishing times, they are a-changin’ and, like Bill Heig says, “That’s gnarly.” - Fulltime fishing guide Nik Dimich . The Fourth of July and our Declaration of Independence in 1776 have again been celebrated and, once again, the day officially named Independence Day has been marked with traditional firework displays across the United States. Just as these fireworks light up the night sky, so do the shiny schools of baitfish that sparkle under water. As we “oohed” and “aahed” over the “rockets’ red glare” the fish didn’t seem to mind what we “land dwellers” were up to. They simply did what fish do best: eat and avoid being eaten. To catch fish now, the ticket (“Jack,” for you Jon Lovitz fans) is to put some flash and sparkle into the water to attract the ones intent on eating, not avoiding. As the water has now warmed to uncomfortable levels, most schools of walleyes have moved away from the shorelines to the mid-lake structures. This usually happens in June and into July according to air temperatures. For the last couple of weeks as we have been fishing the mid-lake structure of large and small lakes, the main thing we have found is to focus on your electronics, whether they are Humminbird, Garmin or Lowrance. On big bodies of water like Leech Lake, Mille Lacs Lake or Lake Winnie, you should get not only a hard copy map of any lake you choose to fish but a GPS unit to find these spots. When big crowds come to these lakes, you’ll see boats cover every hump and bar. The trick is to find the ones that hold fish, and don’t be afraid to go exploring to find those unmarked treasures. Once you’ve located these midlake structures, again pay attention to your sonar unit and wait until you mark a fish. If you are on a small bar or hump and your sonar is empty, most likely your livewell will follow suit. Once you locate structure that is holding fish, you’ll have a few ways to catch them. One is by vertical jigging with a 1/4, 3/8 or up to a 1/2 ounce weighted jig tipped with a minnow. Another is the tried and true way of catching walleyes: dragging a live rig with a 4-8’ long leader and a bead or no bead tipped with a crawler or leech. Using a 1/4 up to 1/2-ounce weight on top of a barrel swivel with a bead in-between will produce the best results. All bait shops and sporting goods stores carry pre-tied rigs in a variety of hook sizes and colors. Try various colors each time and then go with the hot color. On many lakes the weed beds that surround most of these weed and rock structures are small in comparison and generally easier to locate, with exception of Leech Lake, which has lots of rock. Fishing fast, but not furious, and covering “mucho” ground will help you locate active fish, even if they are scattered. All tackle and sporting goods stores for sure will carry pre-tied spinners that come in a variety of lengths and colors. Again, versatility in colors of blades and beads is key. Add a barrel swivel to your main line and be sure to put a bead between the swivel and sinker so the sinker doesn’t jam up. The weight and style of the sinker is very important. Over weeds, use lightweight bullet style sinkers from 1/16 to 3/16 ounce weights to keep you above them. Over weed-free mud or rock bottoms using bottom bouncers, barrel sinkers or walking sinkers will work wonders. If you want to experience the pure, unfettered joy of fishing and want to share that joy with youngsters or “newbies,” head to the thick weeds of smaller panfish lakes. Use small minnows or plastics like Mr. Twister tails on a 1/16 or 1/32-ounce jig with a bobber or pitch and twitch without. Be sure to use bright colors and try to go in the evening if you can. Cast into the “salad” using light gear and I will guarantee you there will be smiles all around as the sunnies and crappies slice and dart on the end of your lines. Remember, however, to take only what you can eat. 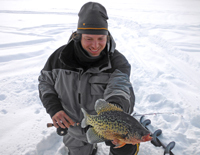 Believe it or not, panfish are a very fragile resource. Encourage others to do the same, especially those who are on the water a lot." - Fulltime fishing guide Nik Dimich . (79) From Wired2Fish; I'm always finding myself trying to get something done in the boat while I'm doing three things at once. The last thing I need is to be messing around with tools that don't work. Wired2Fish has a section full of gizmos and gadgets that will make your fishing trip a little simpler. Before you head out again, click here and check out >> W2F Fishing Tools section. (7/02) Nik’s Tips From The Lake Winnie Region; "You can go home… and even fish/golf there. Novelist Thomas Wolfe once wrote, “You can’t go home again,” a quote that has been used and reused and adjusted many times by many people to fit points they are trying to make. When I told my sister Kisha, the English major, I was going to use this she said I should reference Jay Gatsby and add “old sport.” But when I asked her what sport Jay Gatsby played, she just shook her head, rolled her eyes and told me to wait for the movie. I know many of my former teachers are once again shaking their heads and sighing how we athletes/outdoors people just can’t quite get the deeper meaning of things. To be honest, I guess I do understand that we “really” can’t go home to the same home and life we once had, but when we do go home we certainly can relive and laugh at the good memories and get misty-eyed over the sad ones. What really got me going on this quote was thinking about the various people we have taken on guided fishing trips as they come “home” to visit. The Williams’ family in the photo is a good example. Dr. Jim’s parents are longtime Grand Rapids residents and his wife Martha is a Rothstein. People might leave Itasca County, but the Itasca County in them never leaves. Another good example of “going home” is the number of family groups and corporations who come to this area to reunite or meet in an area and manner that is relaxing and business friendly. One family that comes to mind is State Representative Tom Anzelc’s. Rather than have them get together at a residence, he decided to have a “destination” melding/reunion for the Anzelc/Shevich families at Eagle’s Nest resort on Big Cut Foot Sioux where there was swimming, fishing and boating available. Darin Shevich enthusiastically and expertly spearheaded the gala event. Meals were prepared with a distinct “Iron Range” flavor, including a traditional northern Minnesota fish fry and great homemade venison bacon made by Darin’s brother Dave. As for the corporate/business get-togethers, where do I begin? Many of these groups have been coming to this area to fish and play golf and shop and, oh yes, have meetings, for years and years and we have the good fortune to fish with some of them. One good example is the Gromark group that has been coming to the Koenig family’s North Star Resort for over 20 years. Another is the Land O’Lakes/Purina and Toro companies that golf and fish and meet at Ruttgers Sugar Lake Lodge each year. Still another is the McQuay group and the Western National Insurance people who fish with us out of William’s Narrows Resort. The list goes on and on. So if you are having a family reunion or know of a business group looking for a place to gather, don’t hesitate to mention the Grand Rapids area. There is nothing quite like a “destination” reunion/meeting. If you are fishing deep hump walleyes, again, stay on the fish and if it is calm don’t be afraid to also vertical jig. We did quite well last week hovering over walleyes in 20’ of water. We were also frustrated last week by the varying weather patterns, but it’s all part of the game, I guess. If anybody tells you they always catch fish, well, you make the call; “always” is pretty much impossible. If you need some fishing help for a family or business “destination” reunion or meeting, let us know. We will be glad to help out." - Fulltime fishing guide Nik Dimich . (6/24) Nik’s Tips From The Lake Winnie Region; - How we choose to fish can make all the difference . Eddie Vedder sang in Rise, a song in the soundtrack to the movie Into the Wild, “Such is the way of the world, you can never know just where to put all your faith and how will it grow.” The same is true in fishing, but obviously on a much smaller scale. How we choose to fish sometimes can make all the difference. Before we consider the technique we will use as we “chase” the walleye, let’s look at where we are weather-wise. Because we have just enjoyed our longest day of the year Friday, June 21, 2013 as our summer solstice has come and gone, the days will now get shorter. That being said, we will still be looking at a bunch of much warmer days ahead. As the air temps warm so will the water temps and the walleyes in late June and July will move deeper as the shallow water warms to an uncomfortable temp for them. This warm water will be more than welcome for most of us as we swim, tube, water ski and cruise our lakes in comfort on pontoon boats. As fisherpeople, we will relax from the frenzy of the opening weeks and leisurely roam the mid-lake structures and classic bars, which house active walleyes looking for forage that has moved away from the shorelines. And don’t assume fish bite less in warmer water. They actually feed more. If you have caught and cleaned a walleye lately you will have noticed they are just plumb full of small one inch perch. You will need some luck, as being there during dinner bell hour is the key to getting in on the action. But you can make your own luck by paying close attention to your electronics and staying on the move to locate pods of baitfish and fish. Since fish can’t feed all the time, if you happen to mark fish on the sonar and they won’t bite, keep that spot in mind. As the day progresses and other spots fizzle out, go back and finish where you’ve started. And don’t be a “boat chaser.” Even if there are no other boats there, trust your electronics. As walleyes transition, remember not all of them move to mid-lake structures, some stay and will always be in and around the weeds and on shorelines connected sand flats. They could range from 10-12’ or slide deeper to 15-17’ off the shoreline and even out to the first deep break line of 20-22’ or deeper. Cloudy or windy days are best for the shallower bite. Since these deep-water flats won’t have much structure in the mix, try varying approaches. The two best techniques are spinners and crank baits. Freshwater Hall of Fame guide Tom Neustrom will jig as long as possible, but he is always on the ready to immediately switch over when conditions warrant a change. As Tom says, the key to catching fish is to first find them and then to figure out what they want. His success as a guide is predicated on this simple but highly effective principle. As the water warms and walleyes have a ton of food forage, Tom and other highly successful fishermen will pull crankbaits or spinners on shallow and deep sand flats. This has put numerous fish in the boat for Tom and his clients and the many other great area fishermen during warming waters and a tough bite. Tip the spinners with minnows, crawlers or leeches, but not all at the same time, as this would make fishing pretty expensive. Vary your baits as well as your cranks and spinner colors and go with what works. From the “tip the hat” department, a nice “shout-out” goes to Adam Rabey and Ryan Davis for their astounding 56 plus pounds of caught (7 fish, 26” being the smallest), pictured and released walleyes as they won the Grand Rapids Chamber of Commerce’s annual Pokegama Lake Walleye Tournament. Congratulations as well to Chamber president and tournament director Bud Stone for another great tournament. Try to name another lake in Minnesota where this number of huge walleyes can not only be boated, but also released to fight another day. I can’t think of one. Remember, the best time to fish is when you can and please, if you can, try to take the kids along. They will never forget you did". - Fulltime fishing guide Nik Dimich . (6/21) From Wired2Fish - "David Dudley talks about how effective the Wacky Rig is on the professional bass fishing trail and how easy it is to use and some tips on fishing it better ... >> Click to Read The Power of the Wacky Rig . (6/16) Nik’s Tips From The Lake Winnie Region; - Be patient and be prepared. For walleyes, the time of year is upon us when we need to start thinking about turning to one of our most tried and true ways of fishing: backtrolling a leader rig with a crawler or leech. In warm water (over 60 degrees) using the old egg sinker/a leader/hook or variations thereof will put more fish in your boat day in and day out. This technique, however, takes patience, even for the savviest of fishermen. Because most of us are transitioning from the pop, pop, set of jig fishing, we sometimes have trouble when we change over. It’s a lot like a batter seeing fastball after fastball and then having a change-up thrown. Like Twins Hall of Famer Bert Blyleven says, the key is to be “patient and stay back on the ball.” Likewise, wait on your set like a batter waits on the change-up. Otherwise you will have lots of swings and misses. There are basically two ways to catch walleyes on a rig after the initial pick-up bite. One is to hold and drag until there is sufficient weight on your rod tip. The other is to feed line and count to five or so and then reel down, tightening up and then setting the hook. Either way, wait for the telltale sign, a short tug on the line. If you are the captain of the vessel, you will need to pay attention to the sharp breaks on the mid-lake humps, bumps and bars. Look for mid-lake structure and forage that will attract feeding fish. As the water warms, most walleyes will begin to leave the shallows and head deep until the shoreline weedbeds establish themselves and then they will sneak back. For the deepwater fishermen who prefer fishing walleyes in over twenty feet of water, head to the breaklines and even sometimes the tops of legendary bars and humps on lakes like Big Winnie or Bowstring or Pokegama. Part of summer walleye magic lies in the challenge of the chase. So, again, be patient. This is where your electronics are key. Learn your unit and then believe in it like you believe in your compass in the woods. And if you don’t find fish on your chosen spots, move. If your screen is bare, no matter how good of a fisherperson you are, you won’t catch anything. Keep in mind some walleyes will always stay shallow and be in and around the weeds. Shallow water main lake flats are sometimes great spots to pull spinners or crank baits when the water warms and on flat, but cloudy, days. Sunny days are not usually good days to fish shallow. You may also try this approach over weed beds and on the deeper edges of these areas. All three of these approaches will produce fish; walleyes, northern pike, perch and even bass will all react to these presentations when feeding, especially when you find active fish. I am not saying to catch walleyes you should go deep now. What I am saying is that walleyes are in their transition mode and have been on shoreline structure for a long time and someday soon they simply won’t be there anymore. They will be doing what they do best, chasing pods of shiner minnows and young of the year perch. There are two reasons there are some fish left: they don’t eat all the time and they swim. And from the FYI (for your information) Department, the bug hatches are just starting with the little midge flies just emerging and it will be working its way up to the big bombers, the Mayflies. When this happens, again, be patient. It’s hard to sell a hotdog at a buffet exit. As scouting teaches us, be prepared. And finally, many thanks and Happy Fathers’ Day to all the dads out there. I was trying to find a fitting quote or make one up, but the smiles on the Skinness’ boys faces as they fish with their dad Mitch Skinness says more than any words could. Maybe we who live up north can’t express our affection for water as well as Jules Verne, but we do feel the same wonder he does. We like to cannonball off docks and swim on sweltering hot days. We like to cruise on pontoon boats and we like to feel the deep tugs from wily walleyes as we fight them out of emerging weed beds. We like to hunt for roaming northern pike and cast the shallows for early summer crappies and bluegills. Now, in early June, as the water warms and new weeds emerge, life begins for the young of the year baitfish. Because of this, these new weedbeds are veritable buffets for hungry fish. And just think, almost anyplace we look in the “Land of 10,000 Lakes” there is a fishery beckoning us. Whether they are the clear water mid-sized lakes or the large murky ones or the small waters or even the wild ones in the Boundary Waters Canoe Area, they are all ours to enjoy and protect. To enjoy fishing the smaller lakes in early summer, try locating crappies/sunnies in the shallows. Concentrate on areas that house pencil weeds and bulrushes for crappies and sunnies. When fishing shallow water, use a bobber/small jig rig with a minnow or plastic and cast it in toward the shallows. When you find a nice shoreline where the early sun first warms the water and locate a few fish, try anchoring up. Just be sure not to “cannonball” your anchor and scare the fish. Ease it over the side. Plop that bobber in that “fishouflage” and get ready to reel. An interesting “who knew?” Jeff makes about releasing crappies is that during the spawn male crappies turn a darker black color while the female remains in that silver hue we’re accustomed to during the year. 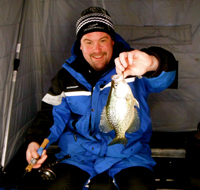 Jeff suggests the “silver chromed” crappies are the ones to release as they are the egg layers and the darkened crappies are the males and therefore the “keepers.” Take advantage of the warming weather and shallow water crappie action. We have waited a long time for each. Walleyes are still moving around lakes searching for shiners and other forage. Locate shoreline structures on wind blown sides of the lake that offer emerging weeds, rocks or gravel. Even more importantly, pay attention to your GPS and sonar to locate sharp break line structures even in shallow water. And don’t just look for fish, look for clouds of bait that look like giant beach balls. Concentrate on breaklines from 6-8’, 10-12’ or even deeper in 13-15’ during bright and calm days. By locating underwater points, flats in areas with new weeds, rock or gravel you will find the habitat/forage walleyes, perch and pike like. Bass also frequent these areas. When fishing walleyes with shiners, keep in mind sometimes the fish will bite lightly. A medium/light action rod helps in these situations. These medium/light action rods are also good for panfish. Another tip that may help you put more fish in the boat while fishing shallow water is to use 4 lb test line. This lighter line is less visible and provides a nicer jig action because it floats better and is more flexible. When you catch fish and then clean them, keep in mind the transportation laws that require a patch of skin on all walleyes, pike and perch when transported in your car or boat after cleaning. It is illegal, by the way, to transport cleaned fish on slot lakes, even with a patch. Crappies and bluegills, however, do not require a patch. Also, your daily possession counts for what is in your freezer per license. 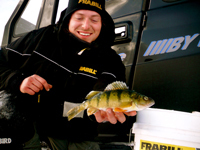 Perch are the only fish species with a double possession limit, but they still may not be transported when cleaned on a walleye slot lake. Enjoy the wonders of water and remember, the best time to fish is when you can and try to take a kid along." - Fulltime fishing guide Nik Dimich . (6/7) Nik’s Tips From The Lake Winnie Region; "I’m hoping this week’s current fishing breakdown will help you put more fish in the boat for this upcoming weekend. On Winnie and surrounding lakes locating wind blown structure on any side of the lake is key. That is why you will hear varying reports on the same lake. Remember, fish don’t bite everywhere at the same time. Also remember to have fish bite; you have to be over fish. Look for shoreline structures offering emerging weed beds near gravel and rocks. These will hold forage for feeding walleyes, perch and pike. Once there, locate breaklines in these areas from 6-8’ and flats in 10-12 and don’t be afraid to slide out to 13-15’ as the fish will move out deeper to follow bait. Crappies have moved in shallow and are in the warm bays with pencil reeds and bulrushes. Flip a bobber with two feet of line with a 1/16 oz. jig tipped with plastic or a small minnow out in 2-5’ of water to keep off the bottom. Anchor up if the wind is pushing you off the spot. 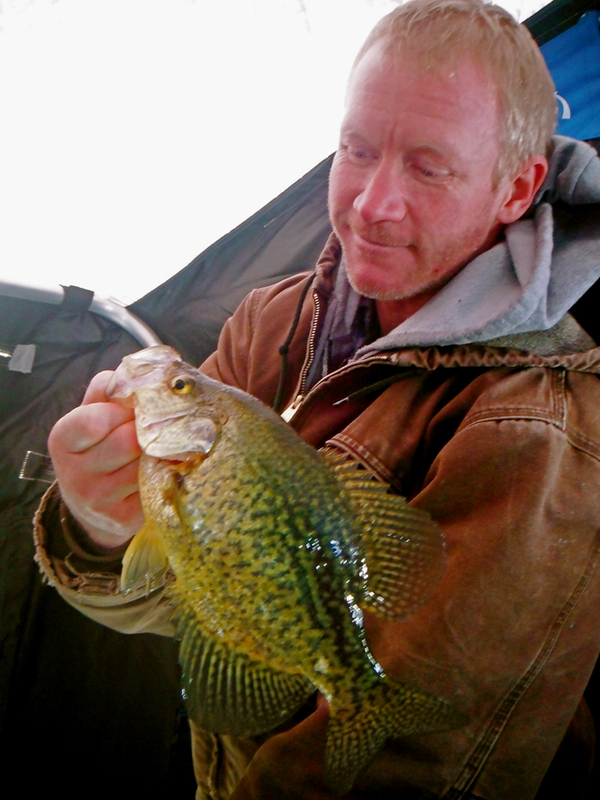 Jeff Sundin’s report from yesterday offers great info on spawning crappies and how to catch them. Sometimes I am amazed at how much detail he goes into and believe me, it is gospel. Over this past week locating wind blown structure on Winnie has produced active fish. Finding pods of bait on your sonar is important and when you do, stick around because the fish aren’t far away and will eventually bite. If you can, take a look at your map and find these locations before heading out on the water. On the south side of Winnie, Little Stoney to the Bird Houses offer good structure. Moving east, walleyes may be anywhere from the Duck Pass all the way to Tamrack Point and into Plug Hat Bay. On the North Shore, try along the Dugouts to Pigeon River and Stoney Point. There is no magic spot. The reason there are fish left is they move. On the west side of the lake fishing Mallard Point to Ravens Point and spreading out to Sugar Bay all offer structure to that’s holding forage for feeding walleye, perch and pike. We have caught fish all around Winnie this week. When the wind blows the walleyes really bite on the Big Pond. For more fishing information that’s still current, scroll down and read my last couple reports. Things haven’t changed that much. The key is that you realize you have to find the fish before you can catch them." - Fulltime fishing guide Nik Dimich . "Mark Twain once wrote, “Age is an issue of mind over matter. If you don't mind, it doesn't matter.” It’s a good thing the fish don’t mind the age of fishermen. Since fishing is a favorite pastime of ours, I was fortunate enough to have a dad and grandpa who not only told me stories about fishing and hunting, they actually took me. But age is something we think about at various times in our lives, even if it is as routine as thinking about those “older” hefty 30’’10-12lb walleyes. Now that summer has officially begun for those of school age, as rocker Alice Cooper sings in his educational anthem, School’s Out for the Summer, it is time to think about those lazy hazy days of summer and, of course, summer fishing. Because summer fishing features more of everything, like weeds and young of the year forage, you will need to look for the structure that houses them. At this time of year think shallow first and then slide out deeper on the flats at varying depths. Remember, school might be out for us, but fish and baitfish are always in schools. On the shallower water lakes, these schools will begin to move from their spawning grounds and spread out around the lake and concentrate on a variety of offshore structures. Locate places with mixed rock and gravel and, depending on the wind, make controlled drifts. To stay at a steady speed, use a drift sock and/or electric/outboard kicker trolling motor, and backtroll to stay at a consistent depth and speed or even hover if you can. While looking for active fish, especially walleyes, focus on emerging weed beds or sand flats where minnows are concentrated. A jig tipped with a minnow is still king at this time of year; however, leader rigs with a leech or crawler will work well. Believe it or not, rigs have already begun to produce fish on Winnie, Bowstring and Pokegema. If it’s calm, try fan casting when you find fish. Even if you are backtrolling or drifting, cast ahead of the backtroll or drift and work back to the boat. Use 4lb test line, as this will offer lethargic feeding walleyes a lighter presentation that will float less quickly to the bottom than 6lb test. I’ve noticed you’ll get a pick up immediately on the drop of the cast or while retrieving and twitching the jig back. Reeling will then trigger inactive fish. Just jig and pause and jig and pause at a slow enough speed to keep the jig close to bottom and in the feeding zone. I’ve been using 1/8 once jigs, but if it’s flat as glass or very shallow, try a 1/16-ounce jig tipped with a minnow. This will also work for crappies, especially now when they’re in or near shallow water to spawn or suspended close to shallow water in post-spawn. Try a slip bobber with a live minnow. This seems to always grab the attention of crappies or bluegills, and who can resist the plop of a bobber. On another note, if you are thinking about preparing for this fall’s deer hunt and are heading into deer country to refresh or establish your mineral licks, check out the Minnesota Deer Hunters Association’s spring issue of Whitetales. It has two excellent articles on mineral licks. If you are intent on creating food plots, do some research and ask local sporting goods and farm service stores for information on product and procedure. And now that “school’s out for summer,” if you can, take a kid fishing or into deer country and, even though it might be a battle, try to leave the electronic games/I Pads, etc. at home." - Fulltime fishing guide Nik Dimich . (5/31) Nik’s Tips From The Lake Winnie Region; "Over the past several days the wind has been steady from the south and south east and swirling at times; actually, we haven’t had a strong west wind in almost three weeks, leaving fish active and spread out in all directions across the big pond and other lakes in the area. Some days when the wind is really blowing there are only certain sides of the lake that are left “fishable.” If it’s not too breezy, try fishing the wind-blown side of the lake because when the wind blows the walleyes really bite on Winnie. When looking for structure to locate walleyes or perch on any lake, especially this year, think shallow first then slide out deeper on the flat at various depths. On shallow water lakes fish have moved out of the spawning grounds and have spread out around the lake on many shoreline structures. Locate places with rock and gravel in the mix and, depending on the wind, make controlled drifts to stay at a steady speed by using a drift sock and/or MinnKota trolling motor, then try back tolling to stay at a consistent depth and speed. While looking for active walleyes don’t forget to try areas with emerging weed beds or sand flats where minnows are holding and other forage for walleyes. The north, west, south and east sides of Winne offer these types of structure. If it’s calm, try fan casting while fishing these areas, even if it’s back trolling or during a drift. Try casting out away from the boat, either deep or shallow using 4lb test line, this will offer lethargic feeding walleyes a different presentation than using 6lb test. I’ve noticed you’ll get a pick up immediately on the drop of the cast or while retrieving and twitching the jig back. Reeling will attract active fish, just pause and jig at a slow enough speed to keep the jig close to bottom and 1-2’ off bottom to keep your bait in the feeding zone. I’ve been using 1/8 once jigs, but if it’s flat as glass or very shallow, try a 1/16 once jig tipped with a minnow. This will work for crappies too, especially when in or near shallow water or suspended close to shallow water. When the bite is sluggish, be patient before setting the hook. A medium light action rod helps in these situations. Jeff T. and his friend Mike caught their fair share of walleyes while on a guided trip with me the other day with this in mind: “Tap-tap…bang” fish on! The walleyes were active, just a bit sluggish on the bite. Dragging and then waiting to set the hook after the initial bite will put more fish in the boat. Over the past week we’ve gotten our client’s walleye limits while catching and releasing nice fish during the day and having some jumbo perch in the mix for a fish fry. If you’re on the fence about choosing a fishing day, we do still have open dates in June." - Fulltime fishing guide Nik Dimich . In his song Open the Door, Homer, Minnesota (Hibbing) native Bob (Zimmerman) Dylan sang, “Take care of all your memories. For you cannot relive them.” These words ring true for any time of year, but on this Memorial Day weekend they ring especially true. Memorial Day is the designated day of year to remember our veterans and their service. It is because of them we can hear the enchanted calls of loons over open water. Because of them we are able to appreciate the majesty of eagles soaring high in the sky and the busy sounds of frogs and crickets doing whatever they do in the evening as the sun sinks into the horizon. Because of them we are free to bobber fish with family and friends for crappies as they move into the shallow break lines and bays to spawn. Fishing with my Grandpa as a kid for crappies are memories I still cherish to this day. And never once did he complain about the five years he spent in the Army during WWII. He would just set me up with a bobber-rigged rod with a small minnow on a jig or hook with split shot sinkers. For me there was and still is nothing better than seeing a bobber disappear under the water. When my face lit up so did his. Who among us doesn’t get excited when the bobber begins its slow sideways decent? Crappie fishing really hasn’t changed through the ages. Simply look for shallow bays with pencil reeds or bulrushes that are as shallow as two feet. Because the water warms faster there, it makes ideal habitat for crappies. If that doesn’t work, locate an underwater point or flat and drift, troll or anchor and cast small 1/16-ounce jigs tipped with minnows. Be very quiet when you locate these areas as crappies spook easily. Also remember that “Big Mouth Billy Bass” will be singing all day long if he is hanging on your cabin wall as, that’s right, bass season opened Saturday May 25. Large and smallmouth bass action will only continue to get better as the water and day temps continue to warm. If you haven’t gone “bassin’” in a while, give it a try. There is nothing quite like having line sizzle off your reel while you pull in “toad” bass out of thick weed cover or river edges or shoreline humps as they transition to where the feed is. As for the walleyes, they’re still there, still hungry and still on the big side. If you are on a slot lake have some fun. Take quick pics and release gently. 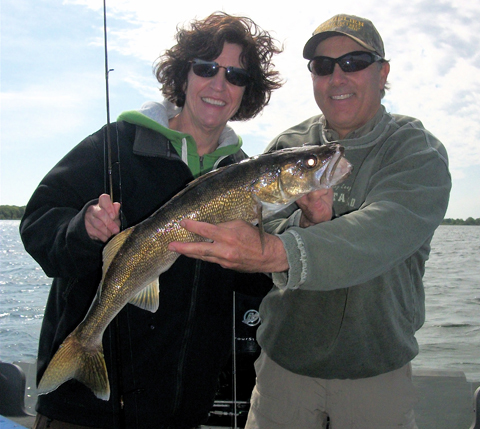 If you aren’t on a slot lake, remember there is still a state slot of only one walleye over 20” per person per day. And if you do “get into them,” use moderation; keep only what you need to eat. The days of the super stringer bragging days and pictures are over. Keep in mind dead fish don’t bite again. On this Memorial Day weekend as I am enjoying our family’s annual outing at our cabin and then our visit to the cemetery to honor loved ones who have passed, I will remember my walk on the beaches of Normandy. As a college student I was fortunate to have befriended a guy who was born in Paris and he took me back there to visit his grandparents. Although I was just 20 and swept away by the mystique of Paris, nothing affected me more than walking the hallowed beaches of Normandy. On this Memorial Day weekend, as I look out over Big Winnie I will truly value what our close family friend Bob Erickson, who just retired as Minnesota’s Commander of Disabled American Veterans (DAV), sent us in his retirement email: “All gave some, but some gave all.” - Fulltime fishing guide Nik Dimich . (5/24) Nik’s Tips From The Lake Winnie Region; - "Warming weather will bring warmer water and transition fish into the shoreline structure. Crappies will move to spawning areas in shallow bays filled with bulrushes and pencil weeds were the water tends to warm sooner. Downsize your jigs and line and use light action rods that have a better hook set ratio while pulling in “slab” crappies. Place a small minnow under a bobber or light jig and start casting and retrieving your bait into the shallows. I like to use Fenwick’s Elite Tech 6’6” medium light action for crappies, walleyes and perch. There are many good rods built today, this is just one I’ve used for a few years now and is reasonably priced at L&M Fleet Supply in Grand Rapids, MN for $119, depending on rod length choice. 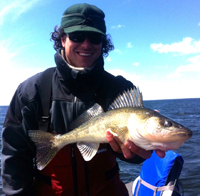 Walleyes are still active and moving towards late spring structures and are feeding on minnows and small perch. Locate structure in 6-8’ with rocks and gravel as these places warm up faster and hold forage, scan areas with deep water close by or an under water point adjacent to deeper water. Don’t be shy about sliding out deeper, 10-12’ or even 15-17’ and work sand flats on the shorelines. If you can find emerging weeds in the mix or close by, then you may be in for a real treat. Some of the fish are still on the larger end and slot protected on lakes like Winnie and Leech, but don’t worry though, keep on enjoying catching them and there will be some nice eating fish in the mix. Over the past couple days it’s been about 1 in every 5 fish caught was a keeper. Jumbo perch are also be holding in these shallow rock and gravel areas as they are feeding on minnows. 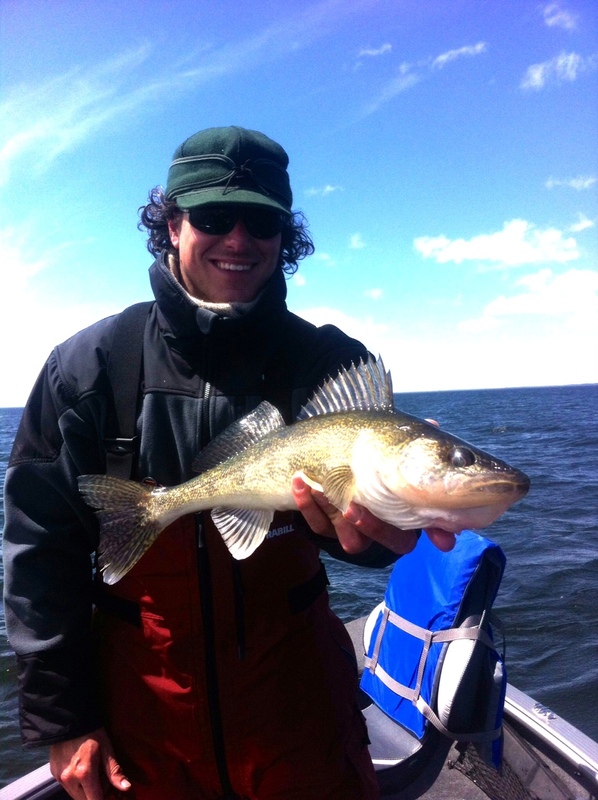 If you can find perch and minnows at this time of year, walleyes usually aren’t to far away. Bass opener is this Saturday May, 25 so get your tackle ready and start thinking about casting into shallow shorelines with emerging weeds. Spawning bluegills and crappies will be close by as this is classic structure. Pay attention to your electronics GPS/sonar and use your MinnKota to control your drift or to troll with. My last report from Tuesday still holds true as good information that will help you put more fish in the boat this weekend. Good luck, keep it safe and have a great Memorial Weekend fishing! - Fulltime fishing guide Nik Dimich . (5/21) Nik’s Tips From The Lake Winnie Region; Find the Bait Find the Fish . Most fish, including walleyes, are now transitioning back in their post-spawn migration. The MN DNR Fisheries walleye stripping operation in Little Cutfoot was completed last Tuesday and their quota was taken in record time. Now the walleyes will head back out to the main bodies of water from the river systems and spawning grounds. You’ll be able to get in on a classic shoreline bite with a jig and minnow for the next few weeks. On Lake Winnie look for walleyes to travel back from Cutfoot Sioux into the main lake. Since not all walleyes make the run to Cutfoot or river systems, but spawn in the “Big Pond,” concentrate on shorelines with sand, gravel and rocky structures. Vary your depths and look for “clouds” of bait. 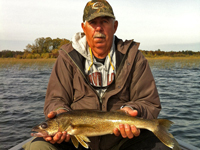 At this time of year the main forage for shallow water walleyes are shiner minnows. If the fish or forage are not shallow, slide out a little deeper to locate bait and active fish. Like Al Linder says, “I hate to say anything in fishing is a no brainer, but if you can find the bait and forage you’ll find the walleyes.” I agree. If you’re fishing for walleyes start on the wind blown sides of the lake, as the waves will push forage into the shoreline. If it is dead calm, “go deeper,” like in a touch football game. Deep can be up to 20 feet, but I would find that depth only adjacent to shallow water. I would not go out to the humps and bump and bars just yet. Pay close attention to your sonar and punch in GPS spots when you either locate structure that has bait clouds or, even better, fish. I’ve used and like both Humminbird and Lowrance; this year, however, on our boats we’ll be running a Lowrance HDS8 and Elite 7hdi sonar/gps units. That is not an endorsement, as most units will help tremendously to find fish and navigate on the open water, just our preference. Remember, no matter how expensive the unit, it won’t help you at all if you don’t know how to operate it. Read your booklet or ask someone who has the same unit. While jig fishing I try to stay around .5 to 1 mph (reading from the gps). I jig off the bottom using different cadences to find how the fish will react. A 1/16, 1/8 or 1/4 ounce jig, depending on wind, depth and fishing preference, will work. Again, try a variety of colors and jig heads. I like to use Northland’s GumBall and FireBall Jigs in lots of colors. Variety is the spice of fishing. So, get your fishing and camping gear out because now is a great time to be outdoors and go fishing. Remember, the best time to fish is when you can and try to take a kid along, in fact, get the whole family out! And also remember, you don’t even have to have a “looper” to go fishing! - Fulltime fishing guide Nik Dimich . (5/17) Nik’s Tips From The Lake Winnie Region; "To say the least, fishing over the past few days has been good. So good, in fact, that we have to remind ourselves that this is not the “norm.” To have fish bite the way they have over the last few days has made putting up with the “ice bowl opener” worth it. Even though I prefer the more humble approach in telling you the fish are biting, I just have to say it…it’s been “wide open” for catching and carefully releasing post-spawn walleyes smack dab after they’ve moved out of their spawning grounds. On Big Cutfoot we have found fish holding at varying depths according to the bait. Earlier this week it was casting into shallows from 10-12 FOW while hovering with the MinnKota transom mount for others and me with their bow mounts. This still worked on Thursday with controlled drifts and backtrolling my Lund with a MinnKota Traxis varying speeds from .5 to .8 mph covering and catching walleyes in a various depths. Look for shoreline structure and under water points adjacent to deep water. Find humps or/and points that come up shallow as 6-8’ and troll off these humps into 12-15 FOW. Covering both depths in the same back troll or drift will allow the fish to tell you how the bite is going. As you go deeper switch to a more vertical jig, like ice fishing. This goes the same for fishing in the Gap between “Big Winnie” and connected Cutfoot Sioux. Try trolling a variety of depths from shallow to deep. The Gap is open and fish are moving through moving back to the Big Pond; however the main lake is still locked up on the east and north shore for a few more days. After this weekend’s rain it will be probably open. We used a variety of colors and jigs from 1/16 ounce on calm days and 1/8 ounce with a little walleye chop. The best presentation was chartreuse in a two-tone color, multi and plain green. However, pink have been a hot color for many fishermen this week, too. We’ve been having luck with Northland’s Gumball and Fireball jigs along with a new jig company called American Jig Company purchased at L&M Fleet Supply in a white glow color. - Fulltime fishing guide Nik Dimich. (5/14) Nik’s Tips From The Lake Winnie Region;“The warm temps predicted for this week will push almost all the ice off most lakes by this weekend. As of yesterday more area lakes have opened up and are free of ice. Most of these are the smaller bodies of water. However, Bowstring is making significant advances and from the north side of the lake to the south it is around 70% open. Water temps ranged from 42 degrees at the mouth of the river to 39 degrees in 12’ of water on Sunday afternoon. On Sunday we searched for fish in traditional spots for this time of year and again found results to be on the slow side. 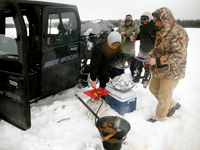 Although it was fun to battle the elements, no fish makes for a poor fry for the camp. We had three boats out early Sunday for a few hours and we did boat some fish with a few other bites too. The fish we marked were spread out across a big flat in 10-12 feet and we found more fish sliding out and holding off the edge into 15-19’. Finding active fish over opening weekend proved to be tough for many fishermen, but many were still proud of the fact they carried on the tradition of opening weekend and enjoyed the company of other loyal fisherman. Hang in there, though, things are looking good for second weekend as the warm May sun will heat things up across “the land of blue sky waters.” - Fulltime fishing guide Nik Dimich . If you asked a hundred fishing people how opener was…you would get, well you guessed it, a hundred answers. How was ours? In a word…unforgettable, and I don’t mean that in a bad way. Prior to opener I don’t know if I have ever heard so much talk about ice and I grew up and played hockey right here in Grand Rapids. Whether in a grocery store, bait shop, sporting goods store, gas station, whatever, like good Minnesotans we talked about the weather and, of course, ice out. Although according to the fishing veterans of our fishing opener get-together, I am but a “pup in the eyes of time,” I do remember the late ice springs of ’96 and ’08. Now, however, I can stand right in there when the old-timers talk about the winters and springs of yesteryear ‘cause I experienced the ice bowl opener of ’13. So, how was the fishing? Well, like they say, the fishing was great, the catching, not so much. We did find open water and boated enough fish for a good fry, but in the “catching struggle” I learned a lot about what fishing and the outdoors really mean to us. I learned from our campfire visitors, the “Grumpy Old Men” duo of Brian Titus and Tom Peltier, that opposites can not only attract, they can even fish together. I also learned that if two guys argue long enough about anything, but especially fishing, they will eventually tire and agree…until the next disagreement. I learned that nothing tastes better than fresh fried fish and that when putting them in the hot oil that they had better be dropped in skin-side down (even though there isn’t any skin, go figure) so they don’t curl. I also learned they taste just as good either way you put them in. I learned rock and roll ended in 1967 and all that came after is just a rehash. I learned that two of our camp’s veterans, my Dad and Ralph, invented jig fishing and knew more about sports than Sid. I also learned they not only walked to school uphill both ways in two feet of snow, they pulled younger kids behind them in sleds. You get the idea. I learned fishing is more than catching and that every good fisherman knows it. - Fulltime fishing guide Nik Dimich . (5/5) Nik’s Tips From The Lake Winnie Region; Tick, tick, tick…with fishing opener only six days away there is still time to make sure everything is ready before you get to the boat ramp. Although some lakes might not be completely open by Saturday, there will still be plenty of places to fish, whether it’s from a boat on smaller water, off shore or from a dock. Here are several tips to help your first day fishing be successful all the way up to setting the hook and that part is completely up to you! Because of the late ice out there is a good chance some docks may not be in at public accesses. If your landing spot is one of these, here are a few things to help you land your boat. One is to bring hip or chest waders, as you might have to go in the water. Having a launch line connected to your boat is also invaluable after you launch your boat, especially if you don’t like to climb in the boat and be backed into the water to unload. If you don’t mind, having someone back you in is a very good idea. That way you can get out of other people’s way while they launch. Just be sure to have everything in your boat prior to putting in. Nobody likes to see a boat being loaded as they wait in line. Another good idea is to wrap your launch line around your trailers launch roller a couple times. 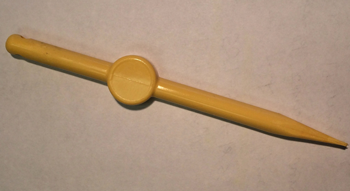 This will hold your boat in place while you detach your trailer strap line and safety chain. Just make sure the boat and trailer is backed all the way into the water before unlatching anything, especially if it’s on a roller trailer. Remember, the heavier the boat the easier they roll and be sure to remember to PUT YOUR PLUG IN and tilt up your motor. It’s more fun to fish in a boat than a submarine. Glug, glug, glug means there is no plug! To battle invasive species from spreading and help protect our fishing lakes for future generations there are a few things, both legally and ethically, that need to be done before leaving the landing after a day of fishing. Minnow transportation from lake to lake in your boat’s livewells is no longer legal. Also, all minnows and other live bait must be dumped at the landing’s dumpsites; this is also where you put aquatic plants that get caught on your trailer and motor and must be removed. If there isn’t a designated dump station then discard minnows and aquatic plants on the ground and not in the lake. If you do wish to transport any minnows or live bait, be sure to carry an extra cooler or an aero-rated bucket in your truck that is filled with water from a well or city water, but not from the lake. You must also drain all water from your boat’s livewells and bait containers and be sure to pull the plug on your boat. Again, all water must be drained from your boat. While being on the water after a long winter’s hiatus is always nice, a bent rod and screaming drag make it all the more enjoyable. If you do get into a nice bite and I hope you do, don’t get so caught in the action that you forget once you reach your boat’s possession limit, you may not fish for that specie anymore. There is no “culling” once the possession limit is reached. Before it is reached, you may cull fish if it is done in a timely matter of returning the fish back to the water. “Culling” fish is the act of releasing a fish to keep another. Again, fish must be returned to the water in a timely matter. Also, when releasing a fish be sure to ease that fish back into the water. You can actually be ticketed for tossing back a fish high in the air. And make sure you don’t keep a slot fish just because it might die. Like conservation officer once told me, it’s all part of nature, nothing is wasted and the “good Samaritan” ruse of “not wasting a fish” won’t work. To help you catch all those fish, I highly recommend buying new line to start the season and re-spool each one of your fishing reels before going out. While doing this be sure and check the rod tip and eyeholes for cracks or breakage that could sheer the fishing line once you set the hook. When getting minnows, be sure to bring all sizes, as with the cold water you never know how active the fish will be. Also try different sized jigs and vary your jigging motion and speed until you find what works. Have fun and be courteous at the landings and on the water. It’s been a long winter. Help people out rather than criticize. Bring and wear your life jackets. Have a throwable seat cushion, etc. Buy a 2013-fishing license. Leave the required sized skin patch on when transporting cleaned fish. Remember your daily limit remains the same regardless if you eat some for shorelunch. Be safe, remember the Titanic and watch out for ice bergs and, if you can, take a kid along. - Fulltime fishing guide Nik Dimich . (5/1) Nik’s Tips From The Lake Winnie Region; Believe it or not, fishing opener is only 10 days away. Yes, the countdown has begun. So much to do, so little time. With all the glorious sunshine and some April showers predicted over the next several days we actually have a good shot of open water on area lakes by opening day. Yep, I hear the naysayers. There’s still 24+ inches of ice on most lakes and open water is delusional wishful thinking. Maybe so, but when a full-blown meltdown begins the ice will turn black and disintegrate and sink faster than a rod dropped overboard. Remember last year? Even though it was a month earlier, we went from driving trucks on the ice to not being able to walk out in just four days. I do agree, however, that it is starting to get down to brass tacks. That’s why I am fired-up by a recent DNR prediction. Even though they cited the latest ice out date on Pokegama as May 10, 1996 (one day before opener) and Winnie May 13, 2008 (three days after opener), there is hope. By opening day that year both lakes were fishable by boat. The average date for ice out on each lake is April 27. After scrutinizing the weather forecast, they predict ice out this year will be May 9! Just in time for fishing opener, but not much time to run your boat. Not that you needed to be reminded, but last year’s ice out was the earliest ever, March 30th. With the sun finally heating things up it finally feels like it’s time to get your fishing gear and equipment organized. I know organizing fishing gear/tackle is kind of like the Never Ending Story but it is time to make a list and check it twice. Even though our lists seem to be endless, especially when we factor in the “new must haves,” there are a few essentials that will save you from scrambling the day before opening weekend. The first is, of course, to try your motor. There is nothing worse than being stranded at the boat ramp with a non-starting motor. If you happen to be fishing in a friend’s or family member’s boat, it is worth sliding this by the vessel’s captain to make sure you’ll be in the front of the boat catching all the fish instead of at the landing wishing you had told the captain. Make sure to charge all your boat’s batteries, not just the starting battery, but the batteries that run your electronics, live wells, bilge pump, etc. Another thing to consider is carrying a set of jumper cables in your boat so you’ll be able to jump your starting battery (or someone else’s) from your bank batteries if it’s dead. Also be sure to check your connections, cables and cords for any sign of corrosion or of varmints chewing on anything, even if your rig was stored indoors. Our fishing licenses expired on April 30th, after this date you’ll need a new 2013 fishing license that can be purchased at any local bait/sporting goods stores. Remember, ignorance is no excuse. Ask anybody who has been ticketed. It’s never a bad idea to buy a duplicate or two and store them in your tackle box, boat, truck or other places. And don’t forget to make sure your boat and trailer licenses are current. Citations have a way of ruining great fishing opportunities in a hurry. If you haven’t already, make an appointment with your local boat dealer quickly to have everything checked and looked over by professionals so you can be assured a starting motor opening day. By making that list and checking it twice before fishing opener you’ll be able to spend a quality day fishing and not complaining of what could have been. Even though there isn’t much time to get ready, don’t worry, your boat and fishing gear will be “sights for winter-sore eyes.”- Fulltime fishing guide Nik Dimich . (4/27) Nik’s Tips From The Lake Winnie Region; "A visit to Bowstring Lake Friday afternoon proved to me there is not only a major heat wave going on but also the lakes and snow pack are really, really starting to thaw. If you were planning on ice fishing over the next several days, I would highly recommend hoofing to your fishing spot. When I drove into the access on Bowstring, the temp outside was above 60 degrees. After unloading, I noticed a few sets of ATV and snowmobile tracks that looked a couple days old. As I approached the lake on my chained-up Grizzly 700 ATV I saw a set of footprints walking back to shore, which is never a good sign. 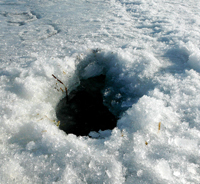 Well… I found out why, 3/4 mile from shore there were scattered pockets of water and slush under the thawing ice crust. Because they are almost up to your knees, these are not easy for an ATV or snowmobile to even crawl through let alone free wheel and if you do get stuck you’re in deep doo-doo. I heard similar reports on Friday form the west side of Winnie were one group has two ATVs hung up and stuck in slush, in fact, the wheelers are still there right now as they are waiting for more melting to free them! Every lake I have been on within 50 miles of Grand Rapids, MN has layers of ice, with the top crust being 8-12” water then the main ice sheet, which is 24+ inches. On lakes like Winnie and Bowstring the top ice crust is so soft you can’t even walk on it with out wading through slush and these lakes are also holding up to a foot of water on top of the ice. This water will start to leak through cracks and funnel back down holes as the ice progressively starts to melt over the next week or so. After a quick move, I hoofed out onto the ice on a lake that had a fishing spot closer to the landing. This lake had similar conditions, with layered ice and slush. All the lakes I visited or drove by are starting to look similar, with grey and dark spots showing through the top ice crust. The lake did support me while walking and I did stay on the top ice crust. My ATV would have broken through, however. After moving around some, the bluegills and crappies did bite. They were active in 8-12’ and showed up quite well about halfway up the water column on my Humminbird. Once again, small “bug” type lures tipped with wax worms did the trick. - Fulltime fishing guide Nik Dimich . 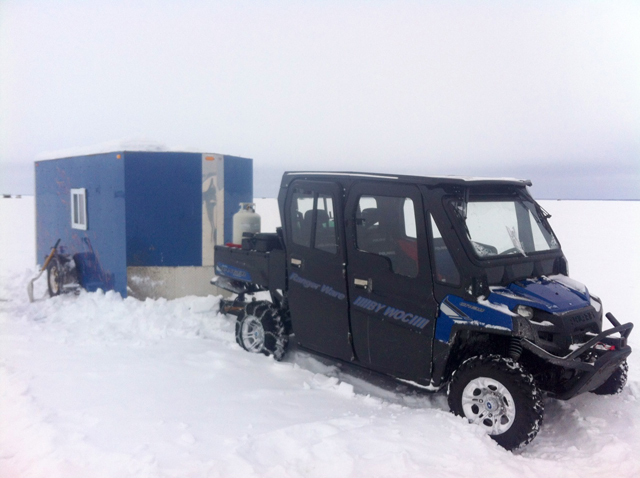 (4/21) Nik’s Tips; While fishing yesterday (Saturday) “getting around” the ice sheet with an ATV was good as gold, with travel conditions good to excellent on Cutfoot Sioux and Round Lake. We had no problems moving around while searching for fish. However, on Cutfoot there was a little more snow drifted in at the public access but this was really no big issue to get through. Both lakes were completely frozen solid down to the top layer of snow pack. There were 24+ inches of ice on both lakes with an additional 4-6” of condensed snow pack on top acting as an additional layer of ice along with the main icepack. Having an auger extension will help you from getting your auger burrowed down and stuck in the ice. Mobility on Winnie was similar with reports of great travel conditions after talking with guys who toured the whole lake by snowmobile. Chaining up your ATV or side-by-side is still recommended. And again, walking is a sure way on and off the lake. We found perch in shallow and caught most of our fish in 8-12’ on a gradual drop off near the main shoreline structure adjacent to deeper water. The crappies, however, were a little tougher to locate. 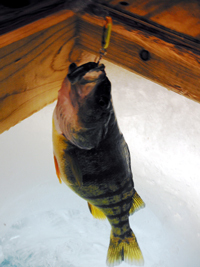 The perch were aggressive and would shoot off bottom to show up on the Humminbird right under the ice sheet at times. Our best luck was using small “bug type jigs” from Northland and Lindy tackle tipped with wax worms. With this meltdown, ice conditions should continue to be good up through this weekend or until temps stay above 50 degrees. 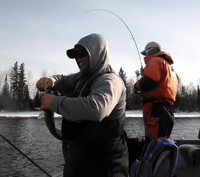 One of the main things April “usually” offers northland anglers is an extended ice fishing season. Ice fishing is, of course, a valued late-ice tradition throughout northern Minnesota and for locals this April has offered an unusually late opportunity to “walk on water.” Also as usual, however, there are strings attached when planning to ice-fish one of the 1,000 lakes our area features. One of the “strings,” warming temps, is actually a double-edged sword. With warming temps during the day, this is definitely the time of year to take a kid fishing in the afternoon like my grandpa took me when I was a kid. Those warm spring days on the ice can create some of our best fishing memories, providing, that is, that you leave anything you don’t want to go down the hole on shore, as I sent two of my grandpa’s favorite tools (an old hatchet & a small ice chisel) to the bottom of Prairie Lake when I was a kid. The down side is, of course, that with warmer temps and lots of snow most lakes are one big snow cone or “smoothie” if you prefer. In other words, getting around on them can be an exercise in futility. Because of daylight savings time, April also offers us extended daylight to fish after work/school in the evenings or on weekends with friends or family. Keep in mind, though, because ice conditions will vary from lake to lake, the best and safest way on and off the ice is always by foot. If you take advantage of this late spring ice transition and head out for perch or crappies or bluegills look for them to be in shallower water and, as always, be safe. Because of their massive size, having at least 30lb-braided line and all the way up to 80lb or more is needed to hoist in these massive pre-historic creatures. A heavy action fishing pole will also save your arms and reduce your reeling time when you latch on to a 60+-inch sturgeon. Muskie rods will work just fine in this situation, too. A light action rod will also work; however, it may take you, like Gilligan, for a three-hour tour. Fishing-wise, use leader (4’ or 5’ long) rigs tipped with a crawler and a heavy weight to hold the bottom in the river current. When fishing the deep slow moving pools of water, to better increase your odds of hooking one of these Leviathans, try anchoring-up with the same technique and simply wait for a bite. Whether you fish the currents of Jurassic Park or the late ice sheets, good luck, be safe and always remember the best time to go fishing is when you can and take a kid along if you can. - Fulltime fishing guide Nik Dimich . (4/18) Nik’s Tips; For northern Minnesota ice fisherman who are still boring holes in the middle of April things haven’t changed too much. Shallow water structures close to shorelines where current flows in or out of the lake are the places to go for spring panfish movements. Hoofing onto the main ice sheet while pulling a sled is still pretty much the only show in town. One thing to keep in mind is that for smaller lakes road accesses onto lakes and forestry roads leading to some of these lakes could be very iffy with the snow melting (surprisingly, it is melting). Under the snow there will be lots of mud to rut up and get stuck in. Also keep in mind that the smaller and mid sized lakes with darker tannic water will have shorelines that will deteriorate faster than other lakes. The first 10-20 feet off shore in the very shallow water before getting to the main ice sheet is where walking will be tough and the ice will pull away from shore. Due to slush from the recent snow travel on Lake Winnie by ATV on the west side of the lake is tough if not impossible unless your wheeler has chains on the tires. Even vehicles with tracks can get bogged down in slush. Remember that every lake differs in snow coverage and that even heavy-duty snowmobiles do not ride as well in slush or heavy snow. If you have a lake close to home and are able to walk to a fishing spot, then you’re set. Otherwise taking a drive to the Rainy River for an opportunity to hook an ancient sturgeon sounds like fun. Our Minnesota Fishing opener is only three weeks away and the rivers are moving. Even if it doesn’t seem like it spring has sprung across the northland. If you are starting to plan your fishing trips for this summer, remember we are currently booking fishing dates for the open water season. If you haven’t picked a fishing day yet, now is the time! - Fulltime fishing guide Nik Dimich . (4/14) Nik’s Tips; “Mr. Winter” is back (maybe he didn’t leave?) and is offering those of us who prefer “walking on water” to fish some extra time to get out in the evenings after work as the sun lingers on the horizon like Johnny Cash’s song, Pie in the Sky. With daylight savings time now in full swing daylight will be increasingly longer, hence more time to fish not only during the week but also on weekends. Not a lot as changed since last week as far as ice conditions go, but one thing we know for certain is the safest way on and off the ice is still by foot. Keep in mind, however, at this time of year ice conditions can and will change dramatically, especially with the recent snow. As the temps thaw and re-freeze, “trouble spots” will be also more difficult to see under the snow cover. Mobility by ATV is still the recommended way to navigate area lakes and chained tires will help tremendously if you happen to become bogged down in slushy situations. The big lakes around Grand Rapids, like Winnie, will be loosening up much more quickly, especially around the edges, than the smaller and mid-sized lakes. This will make these big lakes tough, if not impossible to access, even with an ATV. The mid (like Pokegama) and smaller size lakes will be the better option for “getting out,” especially if you are willing to walk. To access these lakes without overworking yourself, look for lakes with fishing spots close to the landings. This will be most certainly true for panfish. Crappies, bluegills and perch come closer to shore structure and are shallower this time of year. Just be sure to wear waterproof boots and ice cleats. By hoofing it into lakes, you’ll spend more time fishing and less time getting stuck. 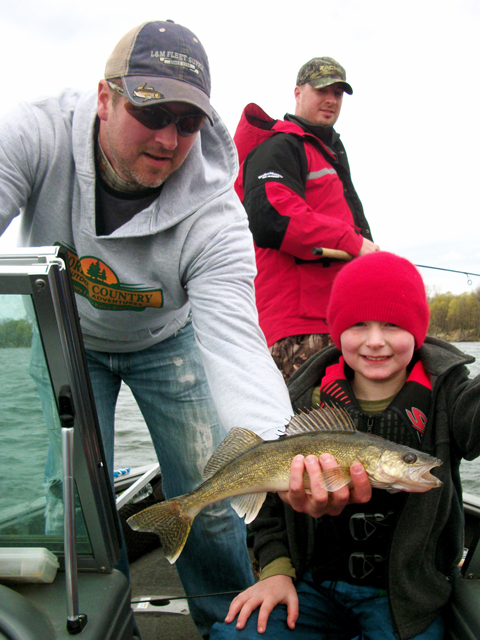 For the anglers who made it up to the Rainy River to fish walleyes, hopefully your fishing trips were fun and memorable, just remember the special walleye season closes Sunday, April 14th, on the River. Those of you who are gearing up to fish the ancient sturgeon, however, will have a couple more weeks ahead of you. When planning open water spring fishing trips (yes, spring will be here eventually) there are a few things to check on the boat and to bring with you that can be easily overlooked. Be sure you have an anchor/rope, a launching rope, and a current boat and trailer license. Have a life jacket for each person and a throw-able lifesaver (not candy and remember, life jackets don’t count, but boat cushions do). Also make sure to change the lower unit oil before running your outboard motor and put in fresh gas. By checking the basics, you will spend more time fishing and less time hassling with things you wished you had done. Like my grandpa always says, “When you don’t use your head, your whole body suffers!” These are just a few quick reminders, as the list of things to get ready for open water fishing seems to be an endless list. Good luck fishing and have fun preparing for our Minnesota fishing opener, which is (can you believe it?) just a month away. 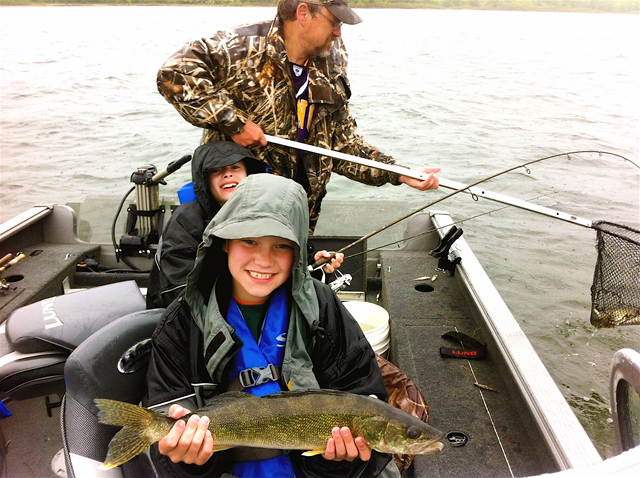 Be safe and remember…the best time to fish is when you can and…take a kid fishing whenever possible. Some of our best memories are created in the outdoors. - Fulltime fishing guide Nik Dimich . (4/12) Nik’s Tips; On Wednesday two of my good fishing buddies and I went up to the Rainy River with high expectations of fishing the legendary pre-spawn walleye bite this river offers. These plans all came together the afternoon before with quick phone calls and vacation days off from work. It must have been a good idea that caught on because we ended up fishing by one of the guys’ bosses. The plans were to meet at Fred’s Bait in Deer River around six and make our way north on Highway 46, which will soon be a familiar site near Lake Winnie which hopefully will be open for the Minnesota fishing opener only a month away! It’s a good thing we made this stop because the extra few jigs we picked up really came in handy as did the couple “key” tips Bill provided regarding bait. To our surprise when we arrived at the Frontier to launch there were only about a dozen rigs in the lot and we were ready to go with no hassle, well almost anyhow. The Frontier Landing has a steep drop off the concrete, which makes it almost impossible to back a big boat and trailer straight into the water. You have to jack-knife your rig and then use the river’s hard bottom to drop your boat in. This really isn’t a huge problem, unless you have a heavy boat, then you may have some troubles as the ramp wants to freeze up from dripping water off the trailers. I run a 20’ Alaskan/Merc tiller 90 and when I backed it into the river it did want to pull/slide the truck a little. But there were no real problems landing. We were also pleasantly surprised that there was only a short wait at the landing! As we made our way down river, we stopped at corners and searched for walleyes in the deep holes and inside edges. At most stops we would pick up one or two light bites but they would drop it and that would be it. After a few more stops, we ran farther down river and found a good bend to fish. While picking away at the inside edges of the shoreline and middle holes we found a bend with a shallow edge leading to deeper water that had some slight valleys between holes. This wasn’t a long stretch, so we made our drifts short. We had better luck controlling our drift and slipping the current kicking in the MinnKota than back trolling into the current. There were other boats, however, catching fish back trolling as well. The best bite we had came in the middle of the afternoon. Our presentation needed a little fine-tuning and our jigging technique had to be just right. Jigging aggressively wasn’t working, so after trying different things we found the most effective was a “Lift, Drop and Drag” technique. The feeding zone was right on or just slightly above bottom. The walleyes were feeding on different types of leeches and parasites that were holding tightly on the bottom. The water surface temp edged up to around 36.8 degrees and the bite was light, almost so light you would feel just a slight tick and have to drag the fish for quite sometime until it would latch up and you were able to set the hook. If you pulled the trigger to soon “a swing an miss” would occur. This is when a good light action rod with a sensitive tip comes in handy. I like to use a 6’6” or 7’2” Fenwick Elite Tech ML action for jigging and live rigging. The river current was moving slowly as mostly everything is still locked up there. The key components for this fishing trip were spinner jigs that triggered the bite, light action fishing rods and using the "Lift, Drop and Drag" technique with 1/4 ounce jigs. We used Northland Thumper jigs and Whistler jig tipped with rainbow chubs. I just might have to head back up to the Rainy River this weekend if steelhead fishing doesn’t lure me back to the Brule River. Jeff’s report from Wednesday held true for us. Again, using the "Lift, Drop and Drag" technique with 1/4 ounce jigs grabbed the attention of hungry walleyes. Patience was also pertinent as the walleyes were biting lightly. Click over to the main fishing reports page to watch Jeff’s video on “waiting them out” and you’ll spend more time “catching” this season than just “fishing.”- Fulltime fishing guide Nik Dimich . (4/10) Nik’s Tips; Mobility by ATV is still the recommended way to navigate area lakes and chained tires will help tremendously if you become bogged down in slushy situations. The big lakes around Grand Rapids, like Winnie, will be loosening up much quicker than the smaller and mid-sized lakes. This will make these lakes tough, if not impossible to access, even with an ATV. The mid and smaller size lakes will be the better option for “getting out,” especially if you are willing to walk because walking is still the best way on and off the lake. To access these lakes without overworking yourself, look for smaller lakes with fishing spots closer to the landings. This is especially true for panfish. Just be sure to wear waterproof boots and ice cleats. By hoofing it into lakes, you’ll spend more time fishing and less time getting stuck. On Pokegama Lake out of the Tioga landing, there were five trucks on the ice two days ago. I know we are still averaging around two feet of ice on most lakes, but I wouldn’t recommend driving out. It’s no fun getting a truck stuck in slush and it may be even dangerous (especially close to shore) as ice conditions vary greatly this time of year. On Bass Lake yesterday I saw a single ATV and another fisherman walking out. If you don’t have a long distance travel to a fishable lake, I would still recommend going ice fishing. But, don’t invest too much time or distance, poor conditions might curtail your trip quickly. 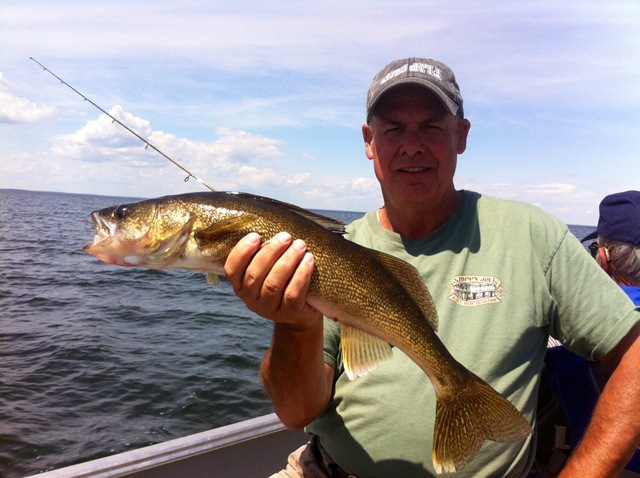 If you are itching for the open water experience, especially for current fishing updates on the Rainy River, click over to the main page and reads Jeff’s report(s) and see his YouTube videos on how to fish current on the Rainy River. After I read his reports and watched the videos, I once again had enough good “intell” to make plans to head back up to the Rainy for another shot at coldwater pre-spawn walleyes. Who knows? Maybe I’ll even hook another muskie on my 6’6”ML action fishing rod and 6 # monofilament! And…I’m not that fussy, I would even catch and release any ancient sturgeon that might swim my way. - Fulltime fishing guide Nik Dimich . (4/8) Nik’s Tips; This weekend's fishing revolved around two rivers, the Rainy River on Friday, Saturday and Sunday's trips were to the mystical Brule River. Even though both involved fishing running water, there are drastic differences; the main one being the "getting around" is a bit different on each. On the Rainy, it’s a boat and my choice is a Lund because it has gotten me to many fishing spots since I was a kid. 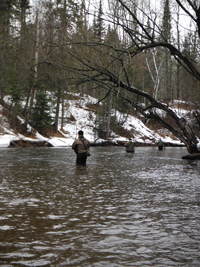 On the Brule, it's moving your feet with a set of good waders to chase trout up the river. For some reason, there is something special about being in or on moving water, whether fishing out of a boat or standing in the current fishing from shore during the transition from ice to open water fishing for walleyes or trout. 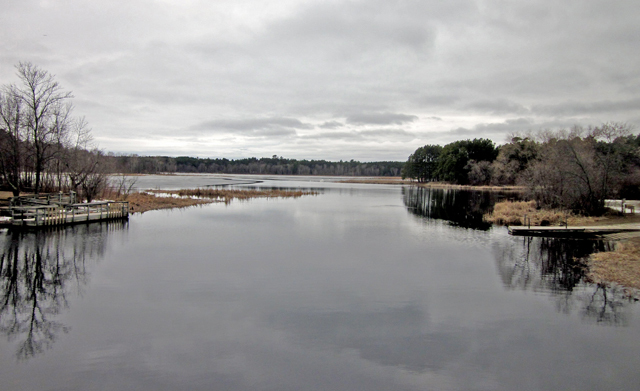 On the Brule River this weekend I noticed more flow and water since fishing there last Wednesday. The belated spring run off is causing the water to rise and with the rising water the ice ridges on the edge of the river are thawing and starting to break away progressively from the shoreline. Places that were fishable on Wednesday have fell into the river or broken down partially moving fisherman to standing water. The rising water and spring run off water makes trout harder to find, even the elusive steelhead gets extra stomping grounds when running up river as the water flow increased. Also occurring with the spring run off is more bugs, worms and bait types of foods will start showing up in the river, if you can match the hatch and get your presentation in the feeding zone, you’ll strikingly increase your “fish on” ratio. The steelhead we caught looked to have been in the river for some time at least, ash no chrome fish were caught by us on this trip, although there were reports of some caught though. Chrome steelhead in the river means they have recently run up river from Lake Superior. A fisherman by the May’s Ledges, we fished both days above and below the ledges, said the water temp was 41 degrees at 1:00 Sunday afternoon. This is still a little on the cold side. Until we get warmer water the active run of trout may stay in the deeper holes in the river. They are still there, however, you just have to go get at 'em! For today, I’ll eagerly be anticipating tomorrows fishing report from the master himself to make a game plan for a trip back to the Rainy by midweek. Tomorrow I’ll have a quick update on ice conditions in the area. Since we are experiencing an extended winter I’ll be out cutting more firewood for the wood stove too, something I can abide with for a little extra ice fishing. For ice fishing information look at the last couple reports and on the main page for current ice/river fishing updates. - Fulltime fishing guide Nik Dimich . (4/8) From Wired2Fish; "Anglers want the best rod for the money so they are lured in by a lot of marketing and actually a lot of misinformation because terms get blended and misrepresented. We wanted to break down all the differences in terminology for anglers. The four primary references to how a rod blank performs include the following. Every good fishing product resulted as the sum of good materials, good engineering and good construction. Fishing rods possess a unique ability to show off great materials and manufacturing yet it still seems so few anglers understand what goes into a rod and what they should"... >> Click here to read full story . (4/6) Nik’s Tips From The Lake Winnie Region; Yesterday’s trip to the Rainy River was a day of firsts for me. The first “first” was it was my first trip to the Rainy River this year and I was able to catch, to my surprise…a muskie. And yes, it was the first one for me. Even though I caught it while fishing for walleyes with a jig and minnow, a muskie is still a muskie. I guess you really never know what will swim up river. If you’re planning on going up to the Rainy River, be ready for a long lines at public accesses. There were two accesses open. One was for smaller john boats that were being launched of the ice ledge like a little submarine. The other was at Birchdale, where one angler informed us his party had arrived at the landing around 7 a.m. and it took 2 hours 45 minutes to land their boat and park the rig. We decided to head closer to International Falls to land the boat and when we got there we found only three trucks and trailers in the lot. Ice conditions and fishing in the area haven’t changed too much over the last couple days, but today’s storm might change things, depending on where you live. 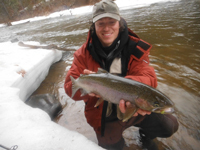 Scroll down and read yesterday’s report and access the main page for current ice/open river fishing news. Today I’m heading to the Bois Brule once again looking for the elusive steelhead and brown trout. Maybe I’ll even catch another muskie! - Fulltime fishing guide Nik Dimich . (4/5) Nik’s Tips From The Lake Winnie Region; "Currently for the Grand Rapids area lakes “mobility” is perhaps even more important than where to fish and how deep the bite is. Although as of late sunshine and windy conditions have helped reduce the snow pack on most lakes, there are still layers of refrozen slush ladened with water on the icepack. Keep this in mind while venturing out to your fishing favorite spring fishing spots. Plenty of good ice still remains, however, so we could have a couple more weeks to ice fish, especially if you’re willing to walk. Getting around on the ice is day-to-day. ATVs are pretty much the only show in town now and having chains on your wheeler will help tremendously to get through those treacherous hidden slushy spots. Be sure and stay on the look out for old auger holes that stayed open during the recent refreeze and expanded while acting like funnels during last week’s meltdown, use caution around these spots as the ice is layered and top layer is weaker in some spots with lots of water in-between. Some lakes, however, may be tough if not impossible to access because of the water and slush from warmer temps and longer sunshine. When in doubt, remember that walking to your favorite fishing spots is still the only absolute way on and off the lake. Just be sure to wear waterproof boots and ice creepers. The perch action is starting to heat up as the walleye’s little cousin enters its pre-spawn stage and puts on the feedbag. Check out shallow water from 12’-18’ and maybe even a touch shallower. Look for rock structure and/or soft slopes in 20’ were bottom bug hatches might be occurring. Try using a tad larger presentation with minnow heads to catch the more aggressive jumbo perch and then downsize you presentation if needed. Crappies and bluegills will also be found on these “buggy” soft slopes in 20’, sliding at times into the steeper slopes in 30 feet. Trust your electronics. Look for suspended fish deep and shallow. Fish two lines if possible (legal for ice fishing, but not open water), one with a bobber and minnow (called a “dead” stick because it is not jigged) and the other jigged lightly with a wax worm. Small bug-like lures work well for panfish, but also switch it up occasionally, especially if the fish aren’t cooperating, with a size up presentation like a Lindy Rattling Flyer or Northland Tackle spoon type jigs. Tipping with a minnow sometimes entices “nicer” crappies or perch to bite. Whitefish and tullibees will also hold on these steep slopes. Use two lines here also, one with a larger spoon to act as an attractant and the other with smaller “bug” jig tipped with a waxie. 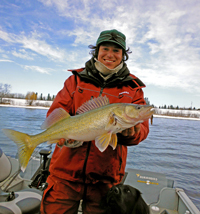 The grapevine has it that the Rainy River is open for boat access in some areas and by clicking over to the main fishing reports page you’ll find even more info. With that river bite just beginning and the Boise Brule trout fishing having opened last weekend, there is still plenty of fishing left to do this spring, even if it is not on the ice. And even if you don’t get out fishing as much as you want, remember April is a good time to watch spring baseball and get the boat ready for walleye opener. Good luck fishing, be safe and remember the best time to fish is when you can. - Fulltime fishing guide Nik Dimich . (4/2) Nik’s Tips From The Lake Winnie Region; "By late afternoon the crappies were participating, with some bonus perch mixed in. My guys had fished the "Big Winnie" area before, but not for several years, and they wanted to catch some "nice" crappies. And that they did and they even let me catch a few. If you hunkered out of the big winds and faced the sunshine, fishing was very comfortable. Ice travel with a snowmobile was also good. With the current warmer weather ATVs are the way to go. Keep in mind, however, that conditions change from day to day as temps climb back into the upper 40s and the winds become more southerly. We found the fish suspending in deeper holes near steep rather than gradual slopes and more perch were holding on and around the 20’ flats and soft-bottomed slopes. Using both wax worms and minnows did the trick. - Fulltime fishing guide Nik Dimich . Nik Dimich and Becca Kent proudly show walleyes caught on a Grand Rapids area lake. 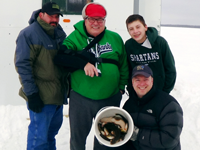 For the Cullen Case family, Cullen Jr., Matt and Evan Jones, fishing with Dimich Outdoors on Ball Club lake out of Gus’ Resort resulted not only in a nice pail of fish but a great two day family outing. A walleye “double” warms a cold, cold, really cold (and windy) fishing day for Justin Harms and Nik Dimich…and a heated wheelhouse doesn’t hurt either. Nik Dimich with a nice smallmouth bass caught on an Itasca County lake while fishing for walleyes. Chasing a tip up is a good day to warm up on a chilly day. Chasing flags and perch'n on Ball Club Lake kept the group busy over the weekend. Upper Red Lake is ready for wheelhouses and during cold fronts being hunkered down in a warm place will be the ticket or a good spot to have base camp. A "tip of the rod" goes out to VMCs new line of spoons. When jigging aggressively or with a little fineness you'll trick neutral/negative fish into biting. On a dead stick (or under a bobber) fish will actually inhale the bait. A resort owners dream, a free day to go out on the lake and fish. 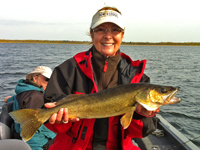 Gail Heig of Lake Winnie's Bowen Lodge , shows off a hefty 26 inch Walleye that she caught on a jig and minnow. Joining the Walleye fishing fun was Bob Weinfurter. A familiar face for guests at Bowen Lodge and a darn handy guy to have around. Quality Walleye are on the move. Ideal "pre-turnover" water temperatures are encouraging feeding, even during bright conditions. Phil Goettl shows off a nice walleye caught on an 1/8 ounce Lindy Jig and Rainbow combination. Choking back a smile that might reveal why he's so happy. Ed Goettl shows off a $20 dollar Walleye that he caught on the rocks in 10 feet of water. Crappies were suspended 6 feet off of the bottom in 32 feet of water. The schools of fish are getting easier to locate now and when you find one, there are larger numbers of fish in each school. 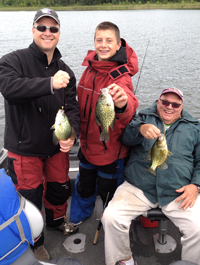 Cullen Case, son Matt and grandson Evan show a triple of early fall crappies caught on a recent Dimich Outdoors guide trip. Megan and Chad Christianson were pleasantly surprised at the numbers and size of the fish their family, especially the kids, caught with us during the daytime. ( Read Report ) . Below: As his niece Mila Adams (daughter of Roni and Kirk Adams) “shakes and batters,” Nik waits to start the fish fry. Photo Nik Dimich: (Above) Doug is ready help land another one of Jack's Walleye. Below: Son Jack proudly displays one of his many “releaser” Winnie walleyes caught in the fog as dad Doug waits to take another photo. By working shoreline structure while pulling spinners you'll have an opportunity at catching multi specie of fish and maybe even a nice one like this on Grand Rapids area lakes! Dr. Jim Williams and wife Martha (Rothstein) Williams of Alexandria with Martha’s hefty 27 inch released walleye on a successful fishing trip while visiting relatives and friends “back home” in Grand Rapids. As walleyes transition, remember not all of them move to mid-lake structures, some stay and will always be in and around the weeds and on shorelines connected sand flats. They could range from 10-12’ or slide deeper to 15-17’ off the shoreline and even out to the first deep break line of 20-22’ or deeper. Happy Fathers’ Day to all the dads out there. I was trying to find a fitting quote or make one up, but the smiles on the Skinness’ boys faces as they fish with their dad Mitch Skinness says more than any words could. For Walleyes don’t forget to try areas with emerging weed beds or sand flats where minnows are holding in cover. Spring minnow spawning runs provide great forage for walleyes. Niko (age 6) landed his first walleye of the year on Winnie over Memorial Day Weekend. By locating wind blown structure with some rock and sand flats adjacent to deeper water brought active walleyes. 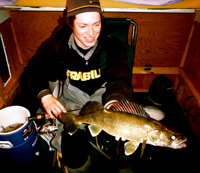 Walleyes are active and moving towards late spring structures and are feeding on minnows. 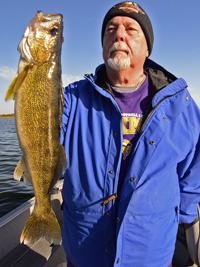 Rod Dimich has been fishing Lake Winnibigoshish for a long time. Fish like this are common on the big lake and he knows where to find them. Teaming up with son Nik Dimich (below), doubles the fun. Locating shoreline structure and under water points adjacent to deep water is the key on Cutfoot Sioux. Look for humps and points that come up as shallow as 6-8’ and troll off these humps into 12-15 FOW. The First River (5-5) at the Mosomo Landing opens a little more each day, but progress is slow. The Walleye Egg Harvest at Little Cutfoot will likely not stsart until after the fishing opener. 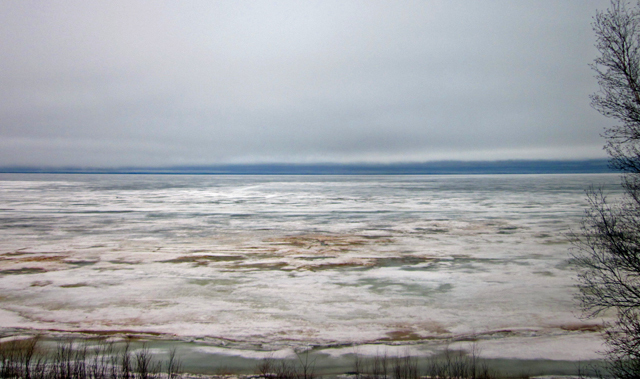 At the East side of Lake Winnibigoshish (5/5), ice is deteriorating, but it's still tight to the shoreline. Perch fishing patterns still focused on shallow water. We found and caught most of our fish in 7-10’ on a gradual drop off the main shoreline structure. Using lighter than average jigs, the most effective presentation was a “Lift, Drop and Drag” technique. The feeding zone was right on or just slightly above bottom. Walleyes coming to the net two at a time is always a good sign. Looks like the boys have it perfected! Grant Prokop and his fishing crew don't mind ice in the Lake Winnie Region at all! 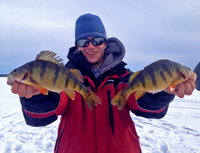 Jumbo Perch are aggressive, ice conditions are good and the crowds are light. Anglers who can match the hatch and get their presentation in the feeding zone, will strikingly increase your “fish on” ratio. For Nik Dimich, his first trop to the Rainy River was eventful. Even if it was un-planned, his first ever Musky was still a blast to catch! Travelling accross Bass Lake, I stumbled into this little hole and started shuffling my feet. Before it was over, I had opened a giant slushy mess of thin, dangerous ice. Perch kept the crew busy during the daytime, by late afternoon, Crappies were participating too. Maybe short-lived, but for now, the traveling conditions on area lakes is good. During the daytime, Jumbo Perch kept Nik's crew busy and by late afternoon Crappies participated too. 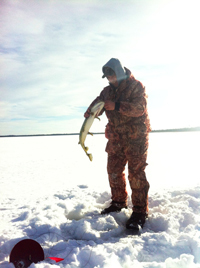 Ice fishing conditions are tough, not impossible. Persistent anglers are finding places to go and conditions will begin to improve daily as warmer daytime temps help erode snow cover. There's still time to lock in your chance at at winning MinnKota's Talon Shallow Water Anchoring System. 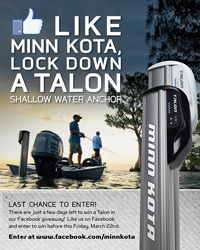 Just click to >> "Lock Down a MinnKota Talon" or click on the image for MinnKota's Facebook page and click to "LIKE" their page. That's it, you're in and by the way, Good Luck! 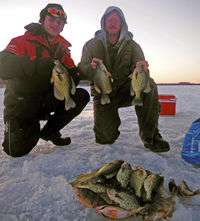 Crappies are going to take some more patience because the schools roam in and out of the main lake basins in around 20’ of water and then will suspend in the 30’ holes. Perch fishing on the big pond of Lake Winnie and surrounding lakes of Ball Club, Bowstring and Pokegama seems to differ as each lake varies vastly in structure and depth. Shore lunch on the ice! What a great way to warm up after you've been working hard to lure those fish in. The inland Walleye Season lasts until Sunday 2-24. For ice Fishing Guide, Nik Dimich they're still biting and he's gonna be out there right up until the end. This one couldn't resist a Clown Color Rattln' Flyer Spoon. 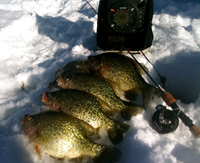 Crappies are catchable where you can find them. Deep snow and moving fish are forcing anglers to leave the trucks on shore and pull out "The Toys".